IPCCC Definition A congenital cardiac malformation of the tricuspid valve and right ventricle that is characterized by downward (apical) displacement of the functional annulus, usually involving the septal and inferior (posterior) leaflets. IPCCC Definition A congenital cardiovascular malformation in which the morphologically right atrium connects to the morphologically left ventricle, the morphologically left atrium connects to the morphologically right ventricle, the morphologically right ventricle connects to the aorta, and the morphologically left ventricle connects to the pulmonary trunk. IPCCC Definition A congenital cardiovascular malformation where the aortic valve is abnormal. IPCCC Definition A congenital cardiac malformation in which there is a ventricular septal defect that opens to the right ventricle in the postero-inferior region of the trabeculated component of the ventricular septum. 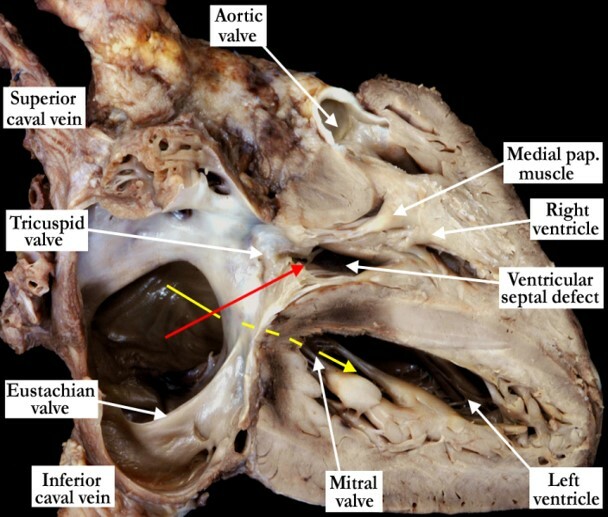 The anterior free wall of the right atrium and right ventricle have been removed to demonstrate a muscular ventricular septal defect along the postero-inferior aspect of the trabecular component of the ventricular septum. 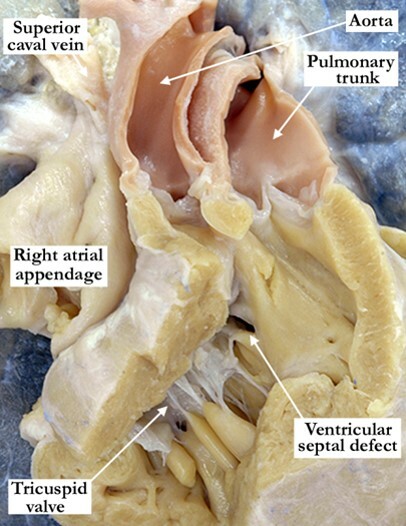 This ventricular septal defect is well away from the septal leaflet of the tricuspid valve and lies near the diaphragmatic aspect of the right ventricle. There are tendinous cords passing anterior to the defect and attaching to the inferior papillary muscle. Note the atrial septal defect and perimembranous ventricular septal defects that were previously repaired. IPCCC Definition A congenital cardiovascular malformation in which a coronary artery communicates, through an anomalous channel, with the right ventricle. 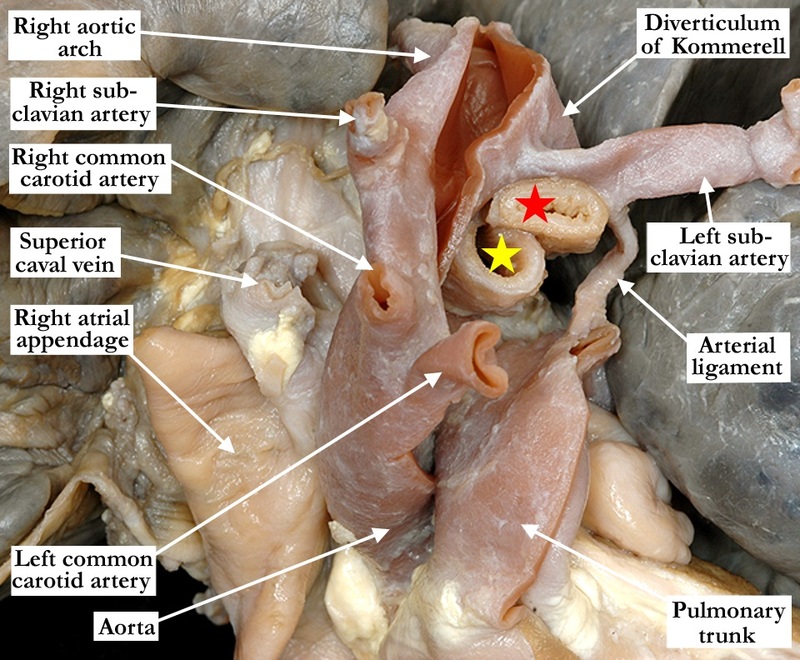 Image #1: In this anterior view, the right ventricle is opened in clam-shell fashion to demonstrate a large, fistulous communication between the coronary arteries and the right ventricle (black arrows). The inferior interventricular coronary arteries both contribute to this fistulous communication. 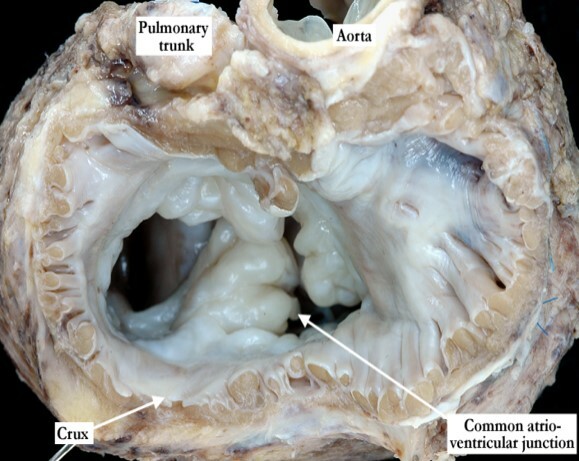 This heart demonstrates the most severe variant of pulmonary atresia with intact ventricular septum in which only the inlet component of the right ventricle is present. The apical trabecular component and the outlet have been mostly obliterated by muscular hypertrophy. 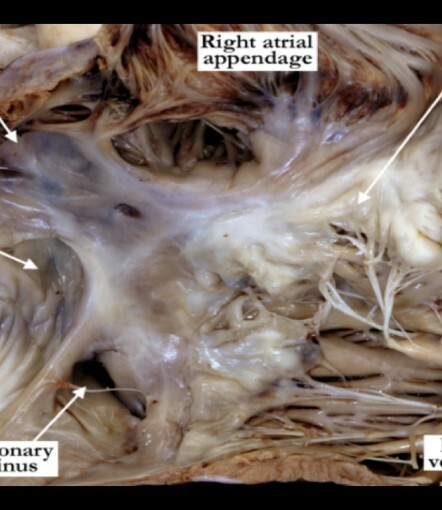 Image #2: This short axis view shows the apical component of both the right and left ventricles with a large coronary artery to right ventricular fistula. Content for Computerized Axial Tomography. IPCCC Definition A congenital cardiovascular malformation in which there is side-to-side continuity of the lumens of the ascending aorta and pulmonary trunk in association with separate aortic and pulmonary valves or their atretic remnants. Image #1 shows an anterior view of the normally related arterial trunks that are clearly separate as they exit the ventricular mass. 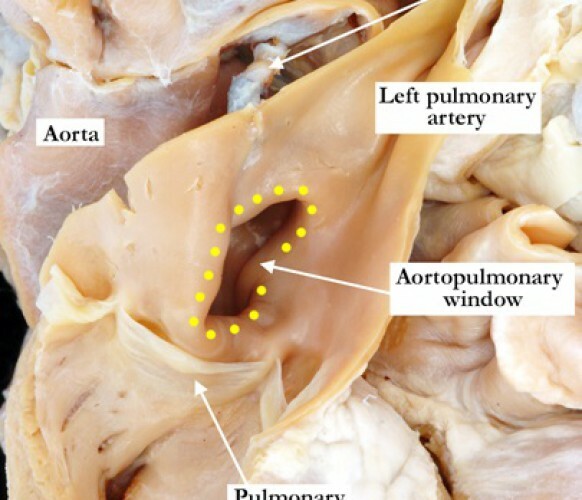 The yellow star marks the outer surface of the aortopulmonary window. The brachiocephalic arteries branch normally from the aortic arch which extends to the left. 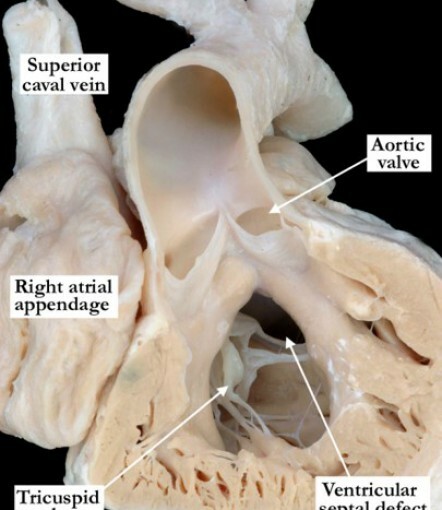 Image #2 shows a similar view of the same heart with the aorta opened from just above the valve, along the ascending portion and into the arch. 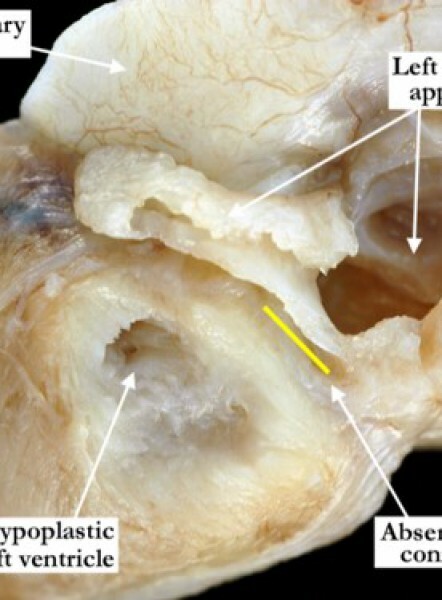 The aortic aspect of the aortopulmonary window is marked with yellow dots. 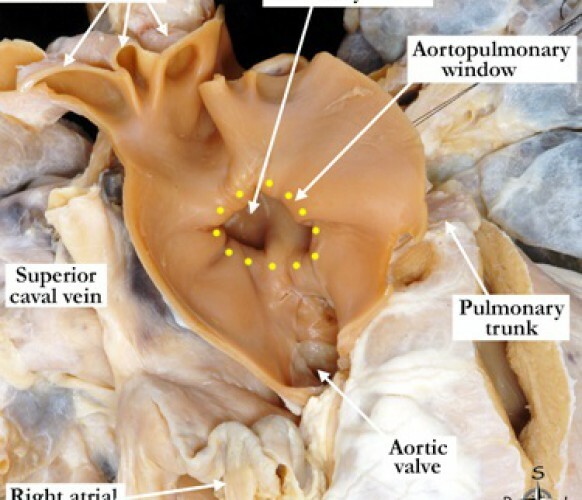 The right pulmonary artery can be seen through the aortopulmonary window. 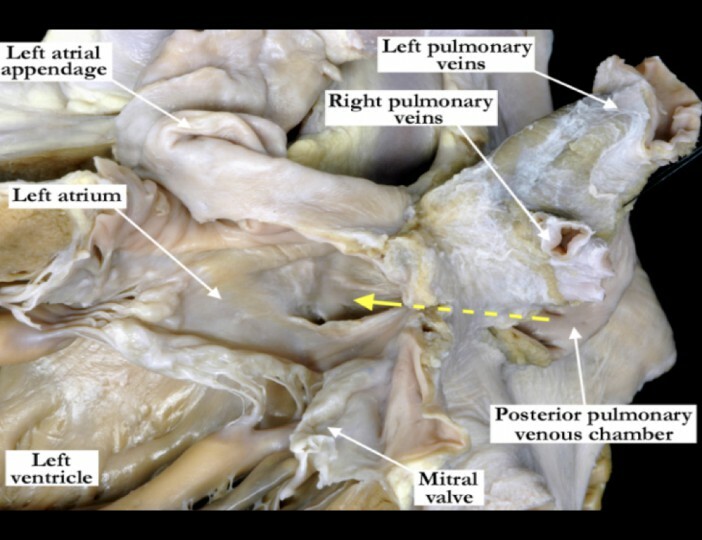 Image #3 shows the opened right ventricular outflow tract, pulmonary valve and pulmonary trunk from the same heart shown in the other panels. The pulmonary aspect of the aortopulmonary window is marked with yellow dots and lies between the valve and the bifurcation of the left pulmonary artery. IPCCC Definition A congenital cardiac malformation in which there is an interatrial communication confined to the region of the oval fossa (fossa ovalis), most commonly due to a deficiency of the primary atrial septum (septum primum) but deficiency of the septum secundum (superior interatrial fold) may also contribute. The anterior wall of the right atrial appendage has been incised and folded away revealing an interatrial communication (atrial septal defect) secondary to a deficiency in the floor of the oval fossa or primary atrial septum (septum primum). IPCCC Definition A congenital cardiovascular malformation where the truncal valve leaflets are markedly thickened with restricted mobility, characterized by the presence of myxomatous tissue. This anterior view of the right ventricular outlet shows an opened common arterial trunk with a dysplastic valve consisting of four leaflets. The leaflets are markedly thickened with a myxomatous appearance. 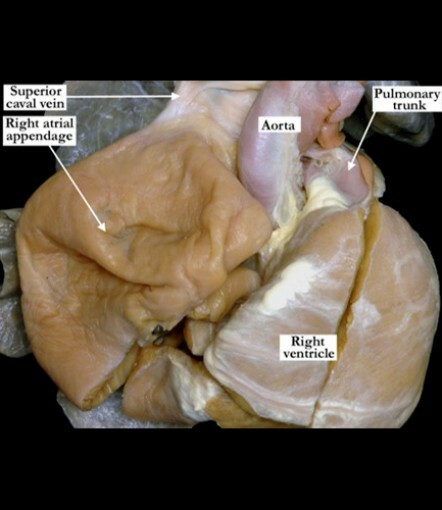 The common trunk arises almost exclusively from the right ventricle and there is a restrictive, interventricular communication (ventricular septal defect) that is subtruncal with perimembranous extension. 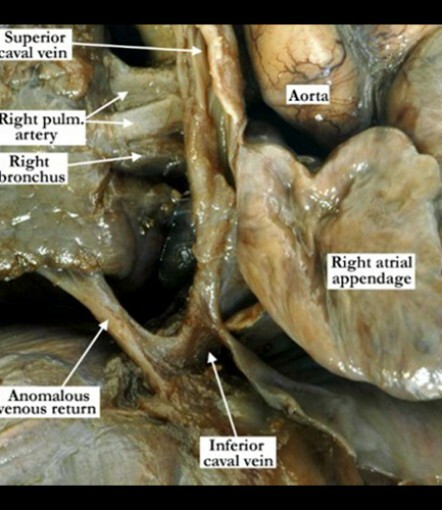 The pulmonary trunk arises very close to a truncal valvar sinus. IPCCC Definition A congenital cardiovascular malformation in which a common arterial trunk is associated with an unobstructed aortic arch and both pulmonary arteries arise from the common arterial trunk. The images demonstrate a common arterial trunk with separate origin of both the right and left pulmonary arteries. Image #1 is viewed from an anterior and slightly superior position with the anterior aspect of the arterial trunk incised and folded forward. The right and left pulmonary arteries clearly arise separately from the posterior aspect of the common trunk. The left coronary orifice arises slightly above the sinotubular junction and the right coronary orifice is not seen. Image #2 shows the posterior aspect of the common arterial trunk with separate origin of the right and left pulmonary arteries. The aortic arch extends leftward, and is unobstructed with the brachiocephalic arteries branching normally from the aortic arch. IPCCC Definition A congenital cardiovascular malformation in which a single arterial trunk arises from the heart, giving origin sequentially to the coronary arteries, one or more pulmonary arteries, and the systemic arterial circulation. 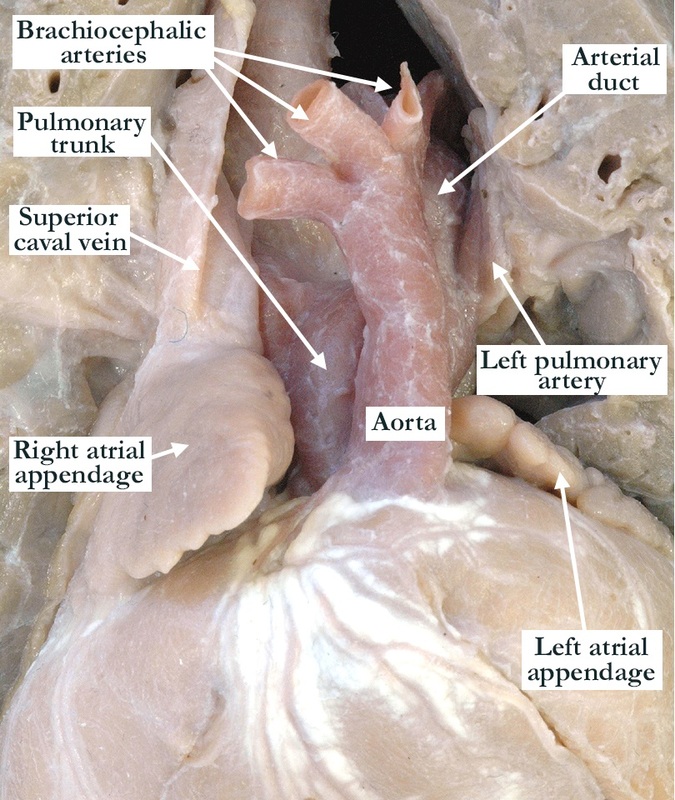 This anterior view of the right ventricular outlet shows a common arterial trunk and an interventricular communication (ventricular septal defect) that is subtruncal with perimembranous extension. 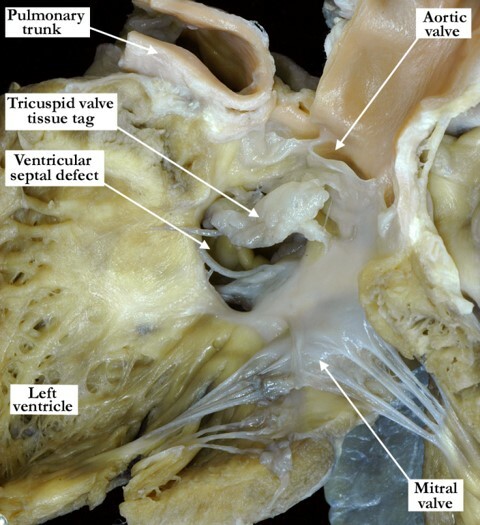 Along the inferior border of the ventricular septal defect the tricuspid, truncal and mitral valves are in fibrous continuity. The truncal valve consists of three, semilunar leaflets that are slightly thickened. The common arterial trunk supplies the coronary, pulmonary and systemic circulation with both pulmonary arteries arising separately from the left posterolateral aspect. 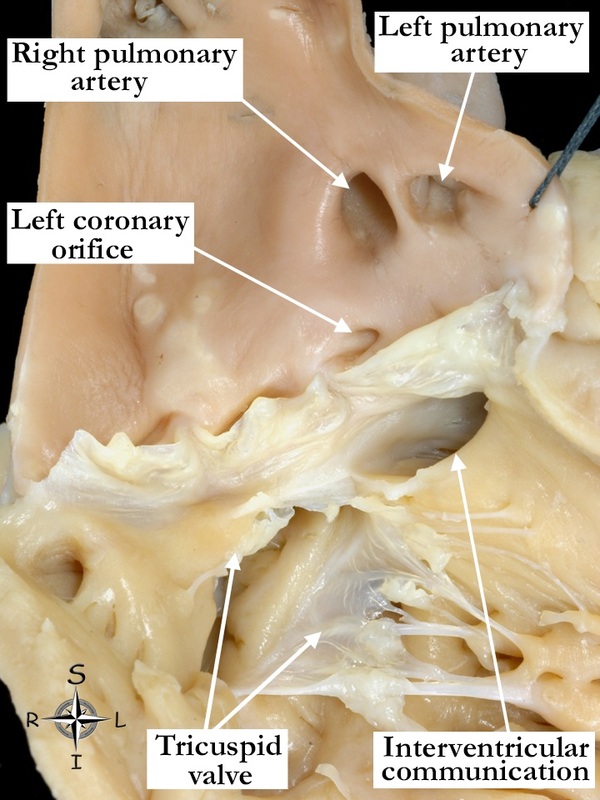 The left coronary orifice arises slightly above the sinutubular junction and has a slit-like appearance. The right coronary artery is not visualized. IPCCC Definition A congenital cardiovascular malformation in which the morphologically right atrium connects to the morphologically right ventricle, the morphologically left atrium connects to the morphologically left ventricle, the morphologically right ventricle connects to the aorta, the morphologically left ventricle connects to the pulmonary trunk, and one or more ventricular septal defects are present. 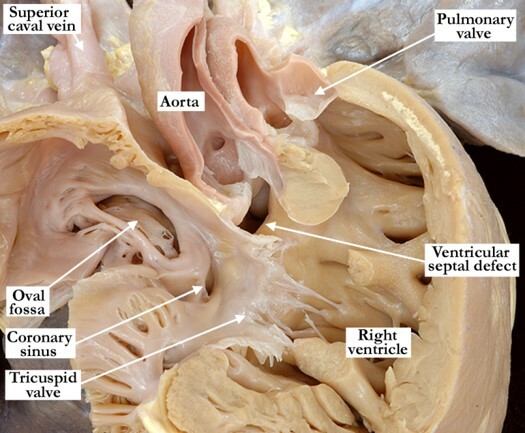 The anterior free wall of the right atrium, right ventricle and aorta have been removed to view the septal surfaces of this heart with transposition. There are concordant atrioventricular connections and discordant ventriculo-arterial connections with the tricuspid valve guarding the inlet of the right ventricle and the aorta arising from a complete muscular infundibulum. The defect extends into the outlet component of the right ventricle and has a muscular postero-inferior border. (Red star – pulmonary trunk) There is an atrial septal defect. IPCCC Definition A congenital cardiovascular malformation in which there is an absence of the renal-to-hepatic segment of the inferior caval vein (inferior vena cava) with connection to a superior caval vein (superior vena cava) through the azygos venous system. 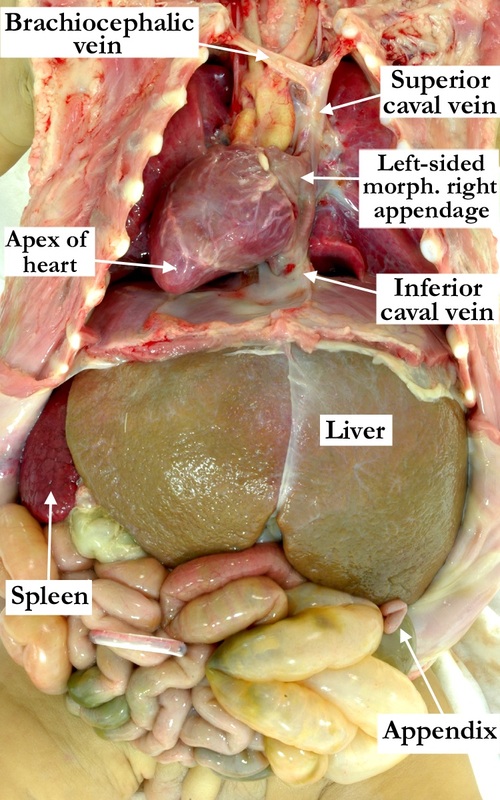 In this posterior view of an organ block prior to dissection shows absence of the renal-to-hepatic segment of the inferior caval vein (inferior vena cava). The inferior caval vein continues posteriorly through the right paravertebral gutter, draining through the azygos vein into the superior caval vein (superior vena cava). In the usual situation, the left renal veins passes anterior to the aorta, but when the caval vein is interrupted, it runs posteriorly. 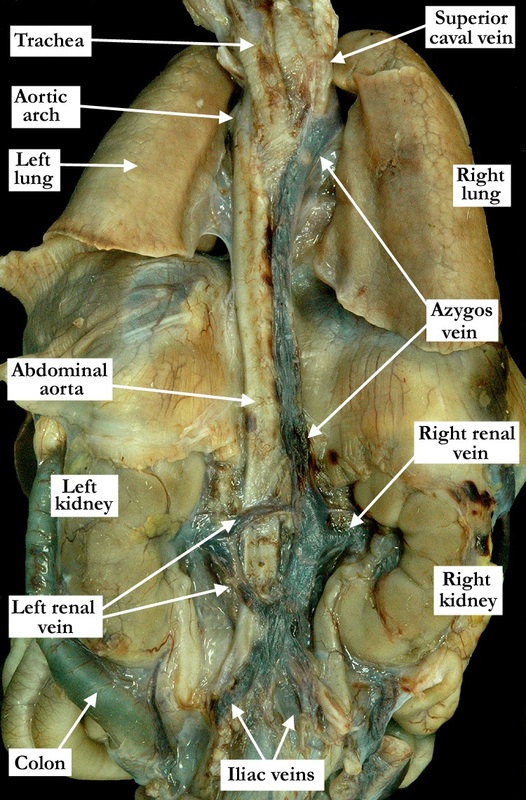 In this specimen, there are two left renal veins. IPCCC Definition A congenital cardiovascular finding in which the course of the great arteries results in a nearly orthogonal relationship of the axis of the ascending aorta to the axis of the pulmonary trunk. This anterior view of the normal heart shows the spiraling course of the intrapericardial arterial trunks. The ascending aorta takes its origin from the rightward and posterior aortic root. The pulmonary trunk, taking a superior and leftward origin, extends to the right and inferiorly as it passes beneath the aortic arch to reach to the margins of the pericardial cavity, where it gives rise to the right and left pulmonary arteries. IPCCC Definition A congenital cardiac malformation in which the orifice of the coronary sinus is narrowed or absent. 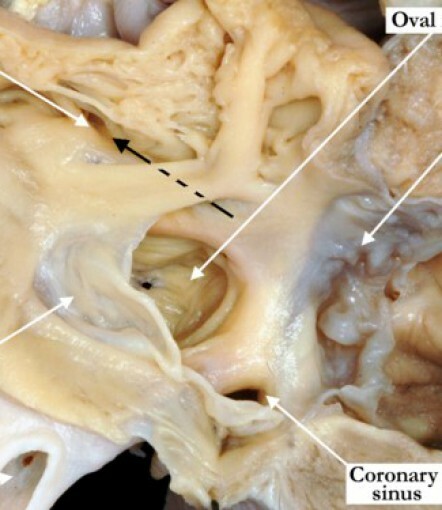 Image #1 shows an anterior view of the right atrioventricular junction in a heart with double inlet left ventricle and atresia of the coronary sinus (yellow brackets). 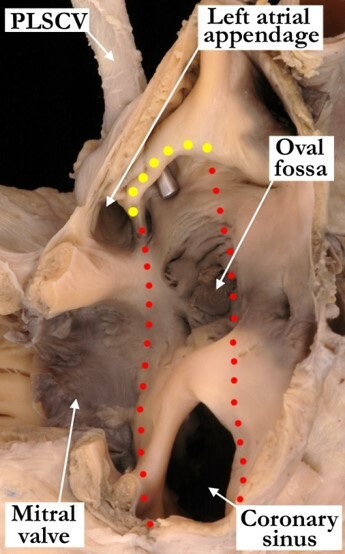 The Eustachian valve is marked with red dots and there is a small deficiency in the flap valve or atrial septal defect at the floor of the oval fossa. The same heart is depicted from behind in Image #2 with a small vertical vein draining the coronary veins that were attached to the obstructed coronary sinus. This vertical vein is in the same position as a persistent left superior caval vein and drains the coronary venous blood to the left brachiocephalic vein. IPCCC Definition A congenital cardiovascular malformation in which the morphologically right atrium connects to the morphologically right ventricle, the morphologically left atrium connects to the morphologically left ventricle, the morphologically right ventricle connects to the aorta, the morphologically left ventricle connects to the pulmonary trunk, and a ventricular septal defect is not present. 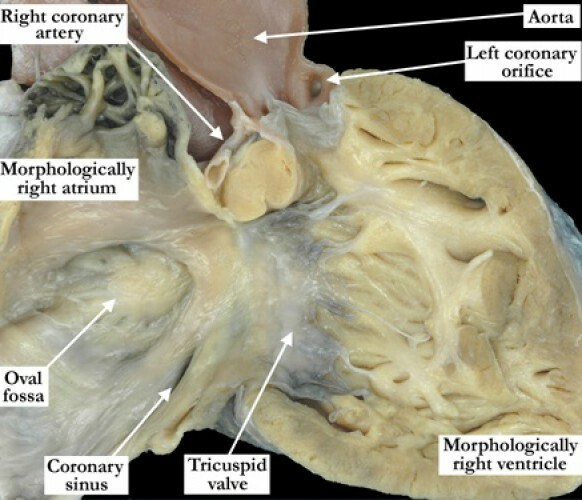 These images show the right and left sides of a heart with transposition, or concordant atrioventricular connections and discordant ventriculo-arterial connections in the setting of an intact ventricular septum. 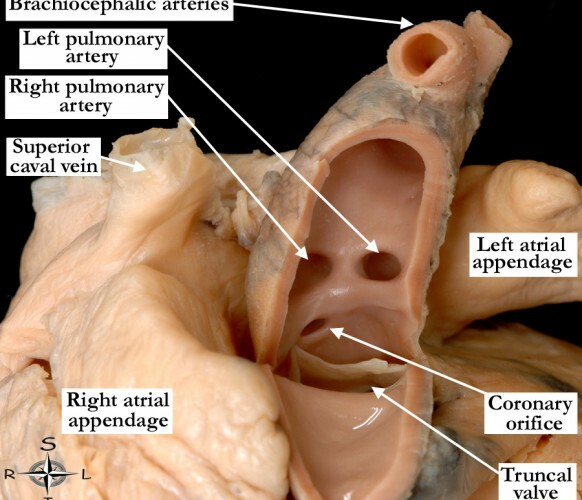 Image #1 shows the morphologically right atrium connected to a morphologically right ventricle through a tricuspid valve with the aorta arising about a completely muscular infundibulum. 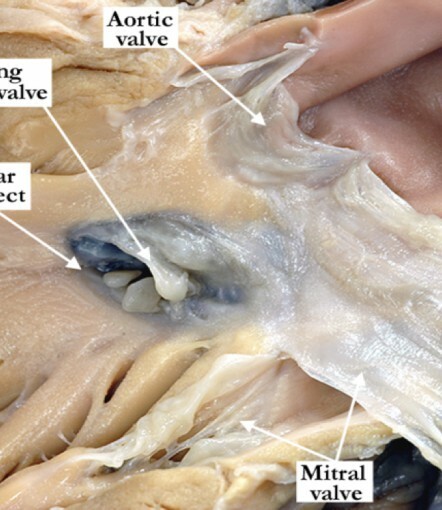 In Image #2, the mitral valve guards the inlet of the morphologically left ventricle with the pulmonary trunk arising from the outlet in fibrous continuity with the leaflets of the mitral valve. The morphologically left atrium is not seen in this image. IPCCC Definition A congenital cardiovascular malformation in which the aortic root or its remnant is positioned anterior and to the left of the pulmonary root or its remnant. This anterior anatomic view shows the aorta anterior and to the left of the pulmonary trunk. The aortic arch extends to the left with the normal branching pattern of the brachiocephalic arteries. Note the pulmonary artery band and the juxtaposed atrial appendages to the left of the arterial pedicle. IPCCC Definition A congenital cardiac finding in which the atrial laterality (sidedness) is normal. 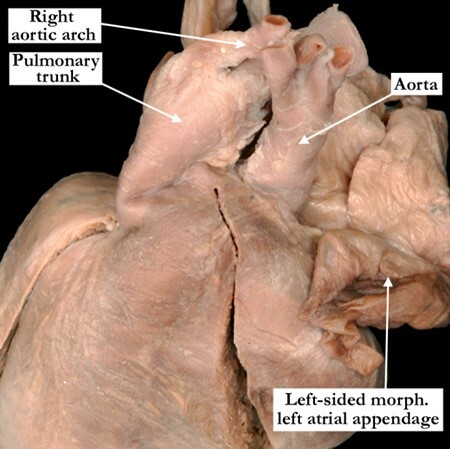 This superior, short-axis view of the base of the heart shows usual atrial arrangement with the morphologically left atrium to the right and the morphologically left atrium to the left. The right atrium demonstrates pectinate muscles around the atrioventricular junction to the crux of the heart. The left atrial vestibule is smooth and the appendage has a narrow attachment with the pectinate muscles confined to the appendage. Note the coronary sinus running in the left atrioventricular groove. IPCCC Definition A congenital cardiovascular finding in which the heart is predominantly to the left of the thoracic midline. This anterior in situ image shows the heart within the chest in its normal position which is predominantly to the left and with the apex pointing leftward. The yellow dots mark the pericardial reflection on the diaphragmatic aspect and the black dots mark its superior-most extent. IPCCC Definition A congenital cardiovascular malformation in which the left circumflex coronary artery arises normally and the anterior descending coronary artery arises from the proximal right coronary artery and courses across the right ventricular outflow tract. 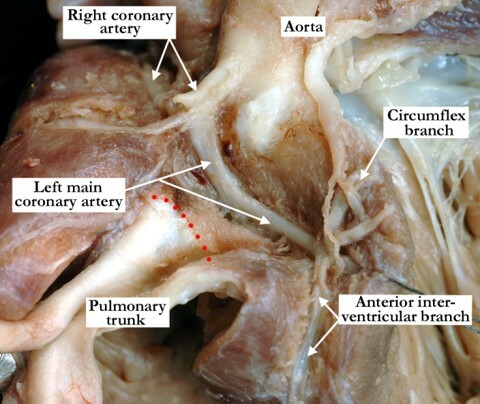 In this anterior superior view of a heart with repaired tetralogy of Fallot, the pulmonary conduit has been retracted forward to show the anterior interventricular coronary artery (anterior descending coronary artery) arising from the proximal right coronary artery and coursing across the right ventricular outflow tract. Note the sutures depressing the pate of the anterior interventricular artery as it takes its normal path along the interventricular septum. The circumflex artery (not seen) arises from its own orifice from the left-facing sinus and extends in the normal fashion along the left atrioventricular groove. IPCCC Definition A congenital cardiovascular malformation in which there is absence of luminal continuity between the right and left branch pulmonary arteries. The heart is tilted slightly to the right in this anterior superior view to show a solitary arterial trunk exiting the base of the ventricular mass. The pulmonary arteries are discontinuous and non-confluent, the branch pulmonary arteries supplied bilaterally via an arterial duct. The right pulmonary artery remains attached to the right lung while the left is suspended by a suture. On the left, the pulmonary artery arises from the usual position of the arterial duct. On the right, it arises from the brachiocephalic trunk (red star). The aortic arch extends to the left and the brachiocephalic arteries branch in the normal fashion. 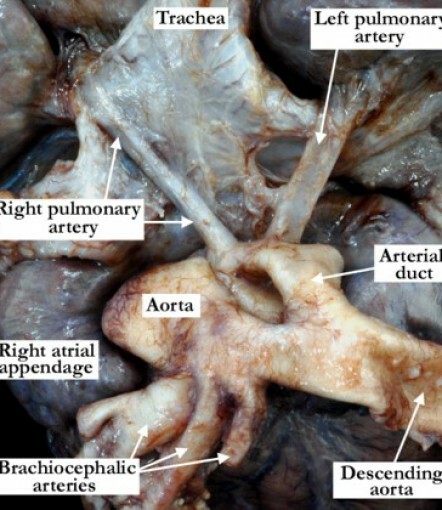 There is no identifiable intrapericardial pulmonary trunk. IPCCC Definition A congenital cardiac malformation in which there is an outlet ventricular septal defect with perimembranous extension, bordered superiorly by the area of fibrous continuity or a fibrous outlet septum between the aortic and pulmonary valves, that is aligned with the trabecular muscular septum. 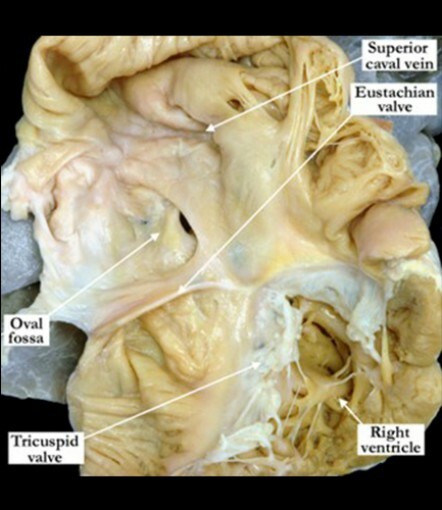 In this anterior view, the free wall of the right ventricle has been folded rightward to demonstrate doubly committed and juxta-arterial ventricular septal defect, bordered postero-inferiorly by fibrous continuity between the leaflets of tricuspid, aortic, and mitral valves. 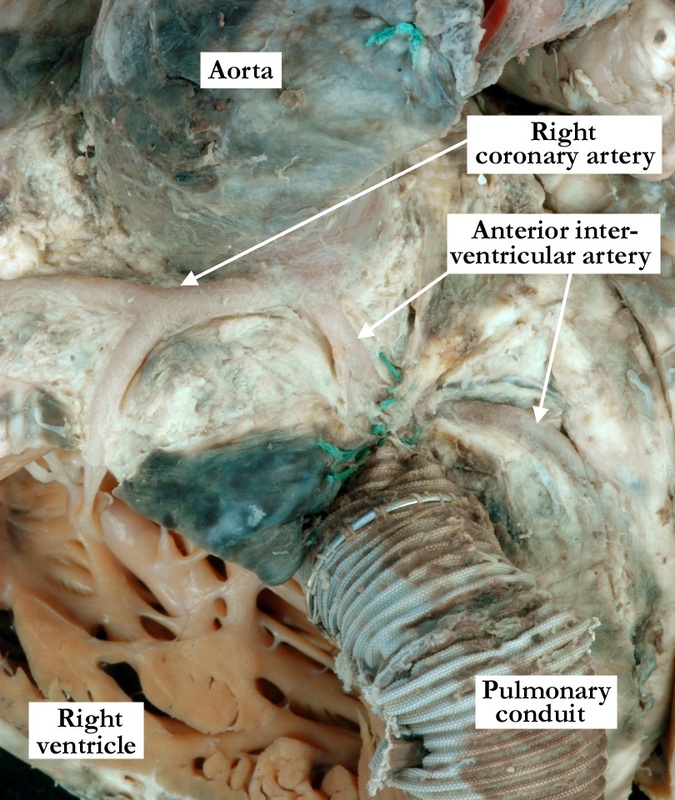 The defect opens to the outlet of the right ventricle between the limbs of the septal band and extends cranially to be bordered by an area of fibrous continuity (black dots) between the aortic and pulmonary valves. There is alignment between the fibrous outlet septum and the apical part of the muscular ventricular septum. IPCCC Definition A congenital cardiac malformation in which the left ventricular component of the common atrioventricular valve has two orifices. Image #1 shows a short axis view of the base of the heart as viewed from the atrial aspect. 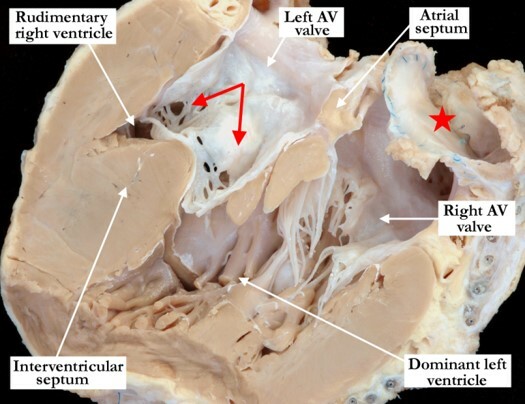 There is an unbalanced atrioventricular septal defect with right ventricular dominance and separate orifices for the right and left ventricles. The smaller left ventricular component itself exhibits a dual orifice. The smaller orifice extends along the postero-inferior aspect of the ventricular septum. 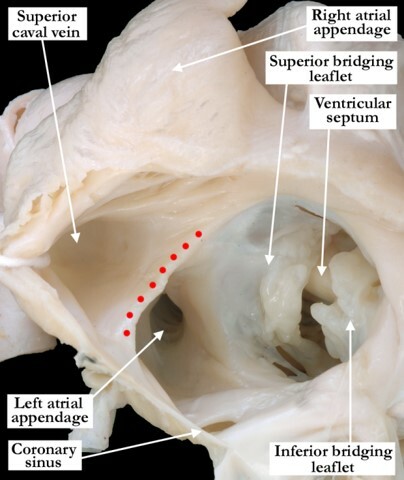 In Image #2, the left ventricle has been opened in clamshell fashion, demonstrating the characteristic scooped-out crest (red dots) of the ventricular septum and the adherent inferior and superior bridging leaflets which separate the common atrioventricular junction into separate right and left ventricular orifices. 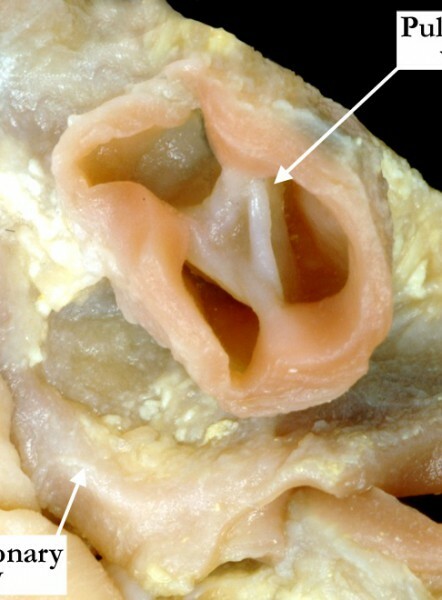 Within the left component, the smaller orifice is supported by its own papillary muscle. IPCCC Definition A congenital cardiovascular finding in which the morphologically right atrium connects to the morphologically right ventricle and the morphologically left atrium connects to the morphologically left ventricle. This heart is sectioned to visualize all four chambers. The inferior half is shows and demonstrates concordant atrioventricular conncetions. The morphologically right atrium is connected to the morphologically right ventricle and the morphologically left atrium is connected to the morphologically left ventricle. The terminal crest within the right atrium is marked with a red arrow. IPCCC Definition A congenital malformation in which there is complete mirror-imaged arrangement of the internal organs along the left-right axis of the body. This is an anterior view of the organs as they lie in the body. There is complete mirror-imaged arrangement of the internal organs along the left-right axis of the body. The superior and inferior caval veins are left-sided and the brachiocephalic vein extends to the right. The apex of the heart points toward the right with its largest part contained within the right hemithorax. The spleen is on the right and the larger lobe of the liver is on the left. The appendix is within the left upper quadrant of the abdomen. IPCCC Definition A congenital cardiovascular malformation in which the aortic root or its remnant is positioned directly anterior to the pulmonary root or its remnant. 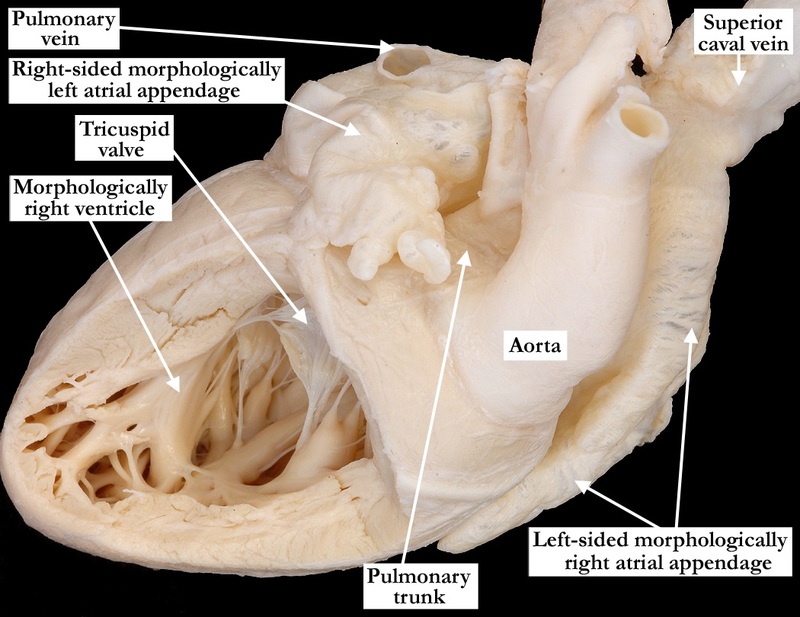 This anterior view of the heart demonstrates the aorta positioned directly anterior to the pulmonary trunk in this heart with congenitally corrected transposition. The aortic arch extends to the left in the usual fashion and the brachiocephalic arteries branch normally. IPCCC Definition A congenital cardiovascular malformation in which the heart is predominantly to the right of the thoracic midline. 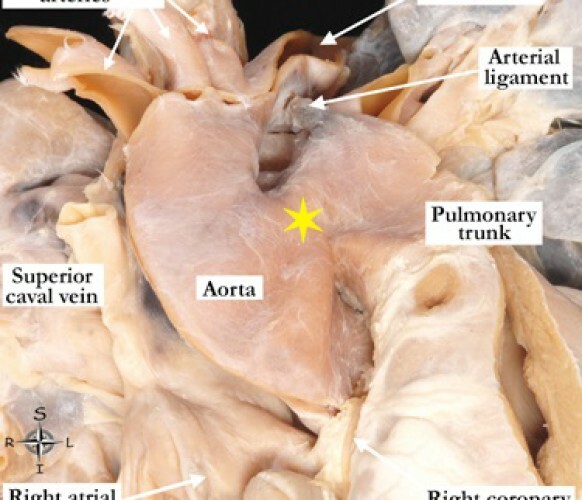 The image shows an anterior view of the organs as they lie within the chest, demonstrating dextrocardia with the majority of the heart lying within the right chest and with its apex pointing to the right. 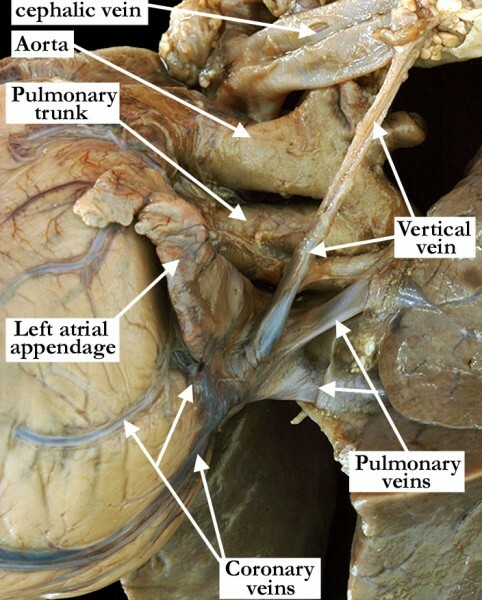 Note that there is also mirror image arrangement of the caval veins, the brachiocephalic vein, and the arterial trunks, which spiral in mirror-imaged fashion. IPCCC Definition A congenital cardiovascular malformation in which there are normally aligned great arteries, no opening between the morphologically right ventricle and the pulmonary trunk, and no ventricular level communication. 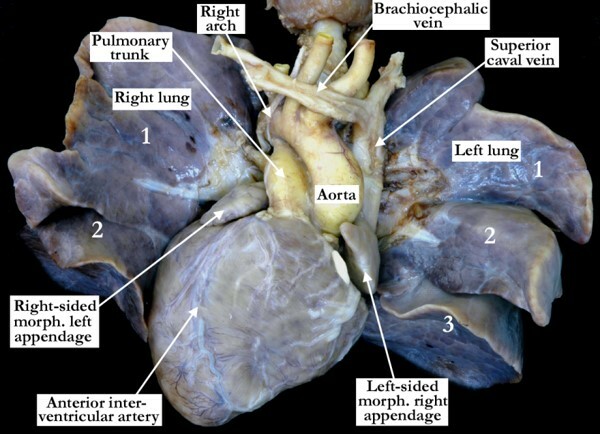 Image # 1: This specimen demonstrates pulmonary atresia-intact septum and is viewed in anatomic position with the free wall of the right atrium and ventricle removed. 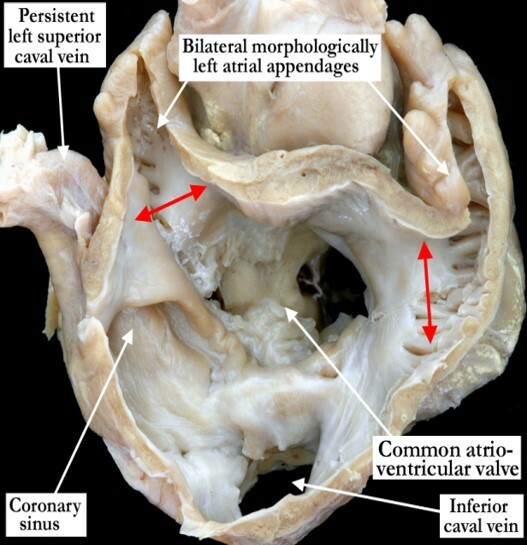 The cavity of the right ventricle is bipartite, being represented only by its inlet and outlet component due to mural overgrowth of the apical trabecular component. This produces a less favorable type of pulmonary atresia-intact septum within the spectrum of this malformation. The outflow tract is patent, but extremely stenotic. At the distal aspect of the outflow tract there is pulmonary atresia with a tiny remnant of an imperforate valve at the ventriculo-arterial junction. Image #2: This close-up view of the atretic pulmonary valve is viewed from above and demonstrates triradiating sinuses peripherally with a tiny, imperforate valve centrally. The dilated sinuses of Valsalva are easily appreciated. IPCCC Definition A congenital cardiovascular malformation in which the proximal coronary artery courses within and parallel to the wall of the aorta before it emerges to assume its epicardial course. Image # 1 is the anterior superior view and image #2 is the superior view of the same specimen. 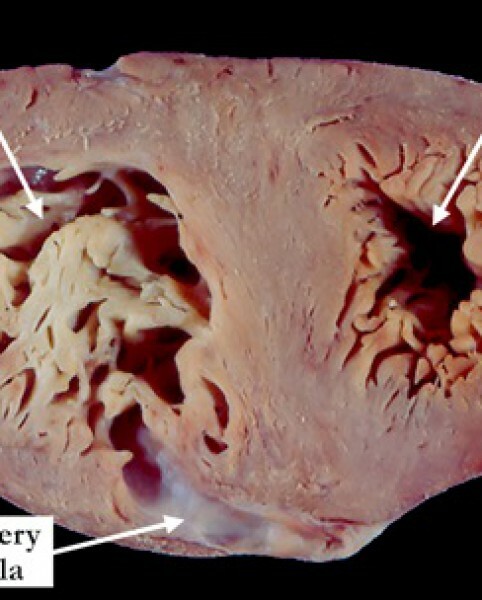 In both images, the pulmonary trunk has been retracted to demonstrate a malformation in which the proximal left main coronary artery courses within and parallel to the wall of the aorta before it emerges to assume its usual epicardial course. The intramural course in this specimen is long and extremely stenotic. The left coronary orifice arises from the right coronary sinus and the coronary artery crosses the commissure (Image #1 – red star) between the right- and left-facing sinuses. IPCCC Definition A congenital cardiovascular malformation in the setting of ventriculo-arterial concordance in which the left coronary artery arises from, or immediately above, the right sinus of Valsalva. IPCCC Definition A congenital cardiovascular malformation in which a coronary artery communicates, through an anomalous channel, with a cardiac chamber or with any segment of the pulmonary circulation. 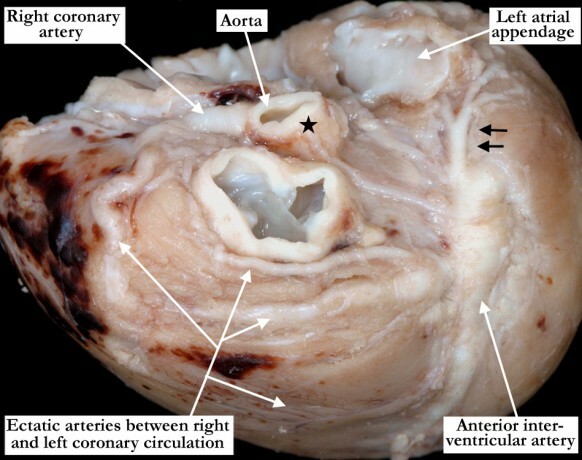 Image # 1: This anterior superior view of an explanted heart with hypoplastic left heart demonstrates multiple, ectatic coronary arteries over the epicardial surface with several communicating arteries between the right and left coronary circulations. These cross the anterior subpulmonary aspect of the right ventricle. The atretic origin of the left main coronary artery is marked with the black star with a long atretic segment extending to the large ectatic portion that bifurcates into the anterior interventricular and circumflex (black arrows) branches. There was aortic valve atresia (not shown). 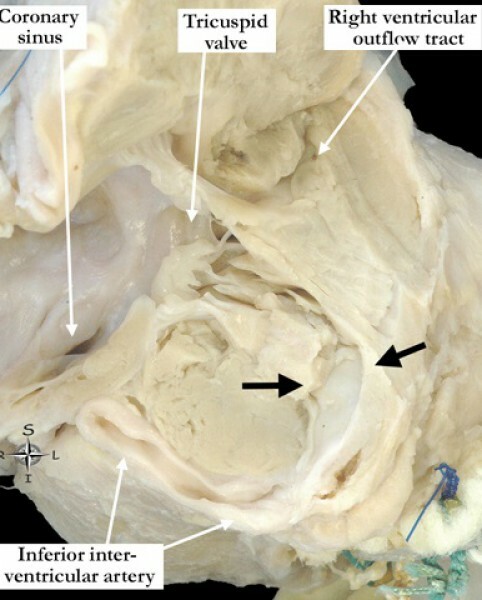 Image #2: A wedge of tissue is removed from the posterior aspect of the same heart seen in Image #1, demonstrating severe mitral valve stenosis and a hypoplastic left ventricle with a large coronary artery to left ventricular fistula. IPCCC Definition A congenital cardiovascular malformation in which a coronary artery communicates, through an anomalous channel, with the left ventricle. IPCCC Definition A congenital cardiovascular malformation in which the origin and/or course of a coronary artery is abnormal. The left ventricular outflow tract is open, demonstrating the aortic root with the normal aorta to mitral valve fibrous continuity. The right anterior interventricular and circumflex coronary arteries all take origin from the aorta via separate coronary orifices. The aortic valve is bicuspid with the incomplete interleaflet triangle or raphe marked with the black arrow and the two normal interleaflet triangles marked with the black stars. IPCCC Definition A congenital cardiovascular malformation in which continuity of the left aortic arch, pulmonary trunk and right arterial duct (or ligament) encircles the trachea and esophagus. 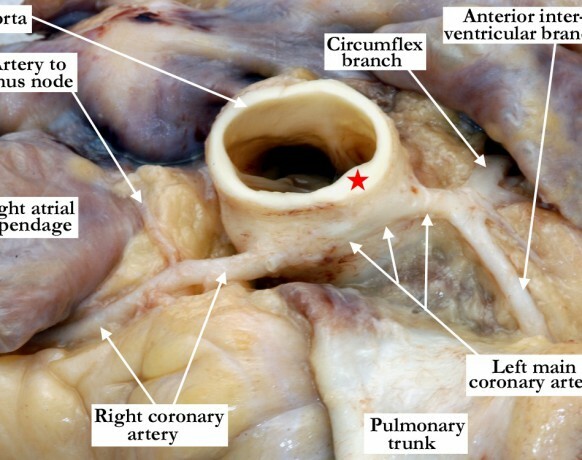 This superior view of the arterial trunks in this heart with concordant ventriculo-arterial connections demonstrates a right aortic arch with mirror image branching of the brachiocephalic arteries and distal origin of the left subclavian artery. Note the left arterial extending from the left subclavian artery to the pulmonary trunk, encircling the trachea (yellow star) and esophagus (red star). 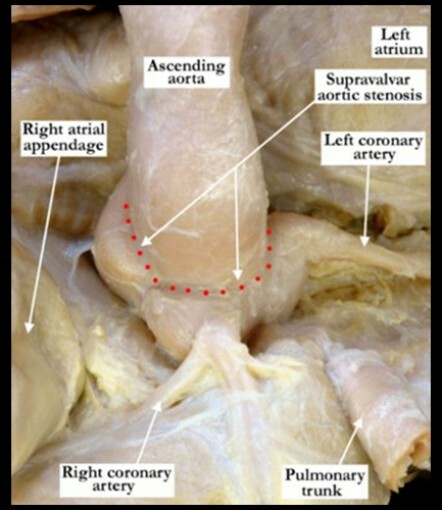 The proximal part of the aberrant left subclavian artery represents the distal remnant of the left aortic arch and is typically referred to as the diverticulum of Kommerell. IPCCC Definition A congenital cardiovascular malformation of the great vessels in which the aortic arch crosses to the right of the trachea. IPCCC Definition A congenital cardiovascular malformation in which the left subclavian artery arises distal to the right subclavian artery in the setting of a right arch. IPCCC Definition A congenital cardiac malformation in which the tricuspid subvalvar apparatus has attachments within both ventricles. The heart has been cut in a plane to demonstrate all four chambers and the inferior half of the heart is shown. 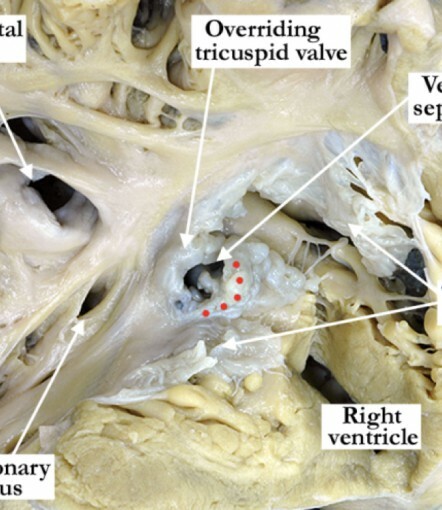 There are concordant atrioventricular connections with straddling and overriding of the tricuspid valve, with the greater part of the valve (double-headed red arrow) committed to the right ventricle. The lesser part (double-headed yellow arrow) marks the portion that overrides the interventricular septum. The tricuspid valve has support from tension apparatus within both the right and left ventricles; the portion straddling and overriding the septum supported by a papillary muscle (yellow star) within the left ventricle. IPCCC Definition A congenital cardiac malformation in which the atrial morphologies and positions are the mirror image of normal. 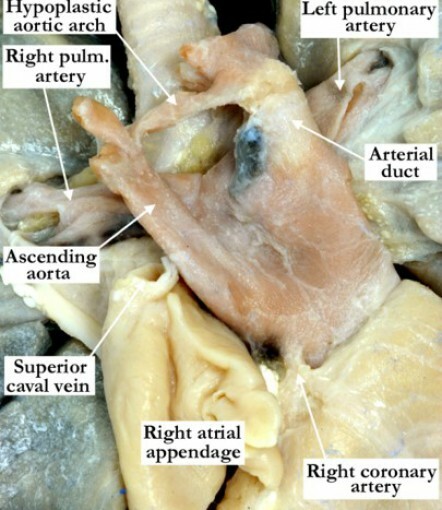 This heart with discordant atrioventricular and ventriculoarterial connections is viewed in anatomic position with a window cut in the anterior surface of the right-sided, morphologically right ventricle. The apex points to the right; there is pulmonary stenosis (not seen in this image) and mirror image arrangement of the atrial appendages. IPCCC Definition A congenital cardiovascular malformation that is a variant of double outlet right ventricle that is associated with an intact ventricular septum. Image #1 shows an anterior view of a heart with double outlet right ventricle that has been sectioned along the long axis. The pulmonary trunk is dilated and there is aortic stenosis (red arrow – pulmonary outflow and yellow arrow – aortic outflow). A portion of the tricuspid valve is attached to the caudal limb of the septal band in the subaortic region. The interventricular septum is intact. Image #2 shows the heart viewed from the posterior aspect, with windows removed from the left atrium and ventricle. 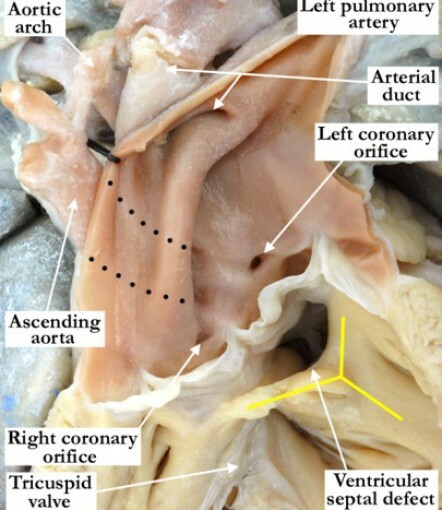 Both left chambers are hypoplastic with absence of the left atrioventricular connection (yellow bar). The views from the left confirm the integrity of the ventricular septum. IPCCC Definition A congenital cardiac malformation in which both atrial appendages have the morphology of a left atrial appendage. This view of the base of the heart demonstrates bilateral morphologically left atrial appendages. The pectinate muscles are confined within the tubular appendages bilaterally and both have a narrow junction (double headed red arrows) with the body of the atriums. The vestibules are smooth circumferentially to the crux on both sides. 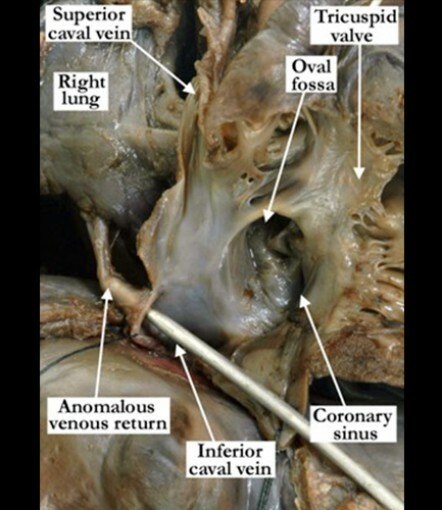 Note the common atrioventricular junction and the persistent left superior caval vein draining to the coronary sinus. IPCCC Definition A congenital cardiac malformation in which both atrial appendages have the morphology of a right atrial appendage. This view of the base of the heart demonstrates bilateral morphologically right atrial appendages. The pectinate muscles encircle the common atrioventricular junction on both sides, meeting at the crux. Note that a tongue of leaflet tissue joins together the bridging leaflets of the common valve, producing separate valvar orifice for the right and left ventricles. IPCCC Definition A congenital cardiovascular malformation in which both great arteries arise entirely or predominantly from the morphologically left ventricle. The left ventricle has been opened in clam-shell fashion, and the heart is viewed posteriorly. 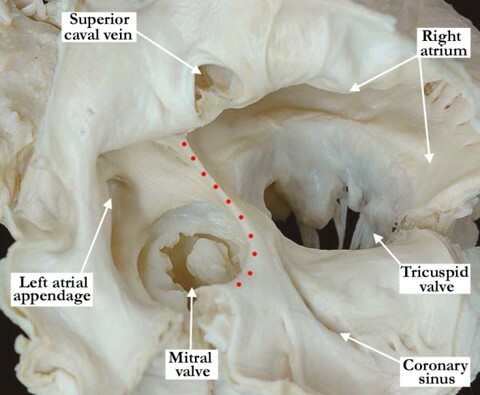 The mitral valve guards the inlet of the left ventricle. There is double outlet (red arrows) from the left ventricle, with both the aortic and pulmonary valves supported by completely muscular subarterial infundibulums. The interventricular communication is subpulmonary and, when viewed from the right ventricle, has exclusively muscular borders. IPCCC Definition A congenital cardiovascular malformation that is a variant of double outlet right ventricle with concordant atrioventricular connections, a subaortic ventricular septal defect, and unobstructed pulmonary outflow tract. This heart is viewed anteriorly and has been sectioned in a long axis plane. Both arterial trunks take origin predominantly from the right ventricle in the setting of a subaortic interventricular communication and an unobstructed pulmonary outflow tract. The defect, which opens to the right ventricle between the limbs of the septal band, is restrictive and perimembranous, since there is fibrous continuity between the leaflets of the aortic and tricuspid valves. 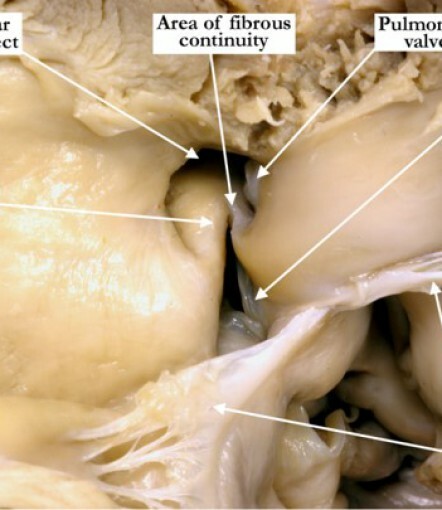 The aortic valve is also in fibrous continuity with the anterior leaflet of the mitral valve. IPCCC Definition A congenital cardiovascular malformation that is a variant of double outlet right ventricle with concordant atrioventricular connections, a doubly committed ventricular septal defect with absence or deficiency of the conal septum, and pulmonary outflow tract obstruction. 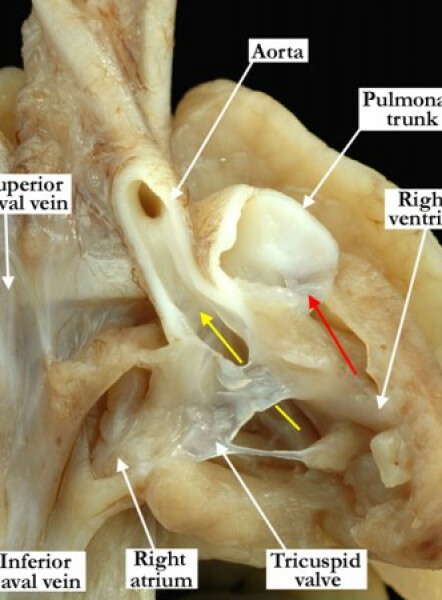 The right ventricle is opened in clam-shell fashion and viewed anteriorly to show both arterial trunks arising from the ventricle, producing the ventriculo-arterial connection of double outlet right ventricle. 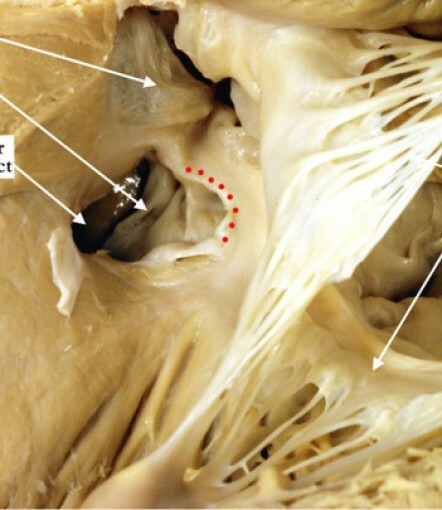 In this heart, the outlet septum (black asterisk) is fibrous rather than muscular, due to the presence of fibrous continuity between the leaflets of the pulmonary and aortic valves (yellow double headed arrow). In this case, there is also pulmonary stenosis. The interventricular communication lies between the limbs of the septal band, with fibrous continuity between the tricuspid and aortic valves, rendering the defect perimembranous. The defect is doubly committed, opening beneath both arterial outlets. This anterior view of the heart and lungs demonstrates complete mirror-imaged arrangement of the internal organs of the thorax along the left-right axis of the body. The bronchial morphology (not seen here) was mirror-imaged with a trilobed lung on the left and a bilobed lung on the right. The cardiac apex is to the right, the caval veins are to the left with a mirror-imaged brachiocephalic vein. The atriums and ventricles are mirror-imaged and there is mirror-imaged spiraling of the arterial trunks. The aortic arch is to the right with mirror-imaged branching of the brachiocephalic arteries. IPCCC Definition A congenital cardiac malformation in which the vectors of the atrioventricular inflow tracts are approximately orthogonal (perpendicular) to each other. 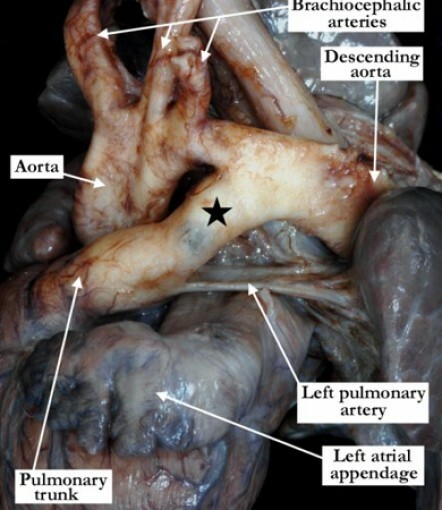 This heart is viewed in anatomic position and is sectioned in a long axis plane demonstrating the features of a crisscross heart (twisted atrioventricular connections). In this heart, the vectors of the atrioventricular inflow tracts are approximately orthogonal or perpendicular to each other. The right atrioventricular connection is marked with the red arrow and the left with the yellow arrow. This heart has concordant atrioventricular connections and discordant ventriculo-arterial connections. IPCCC Definition A congenital cardiovascular malformation that is a variant of tetralogy of Fallot in which the ventriculo-arterial junction of the right ventricle with the pulmonary trunk features an atypical valve with rudimentary leaflets (cusps) which do not coapt. IPCCC Definition A congenital cardiac malformation in which there is almost complete absence of right ventricular myocardium and preserved septal and left ventricular myocardium. The right atrium and ventricle have been opened in clam-shell fashion and are viewed from the antero-lateral aspect. There is almost complete absence of the right ventricular myocardium in this heart with an unguarded right ventricular inlet (yellow dots mark the atrioventricular junction) and pulmonary atresia with intact ventricular septum. 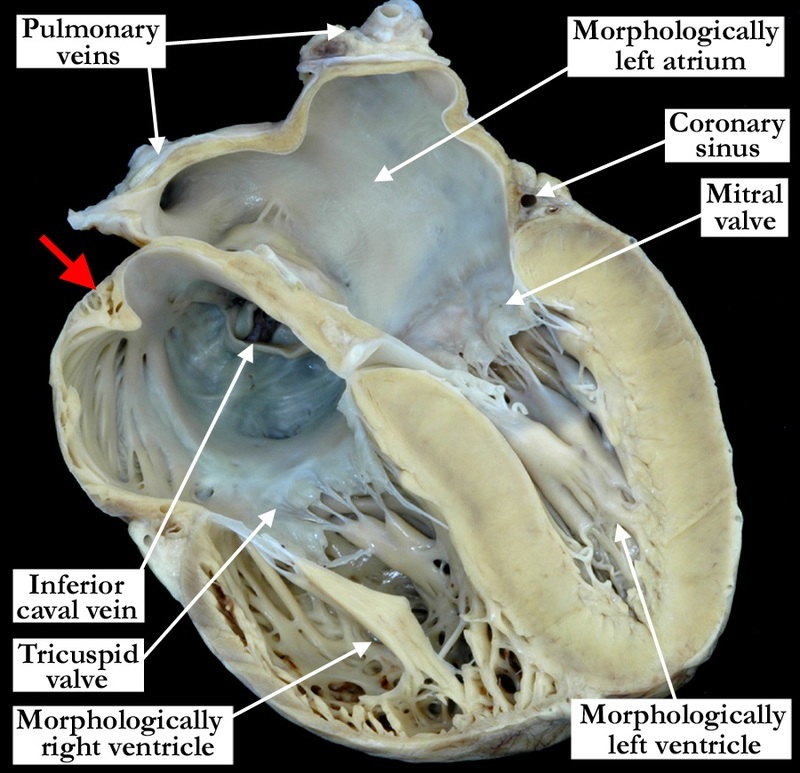 The septal and left ventricular myocardium are preserved (left ventricle not shown). IPCCC Definition A deficiency of the atrioventricular component of the membranous septum permitting shunting of blood from the left ventricle to the right atrium. 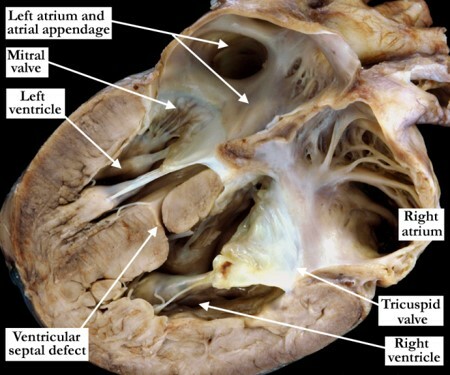 This surgeon’s view of the right atrium and right atrioventricular junction shows a Gerbode defect. 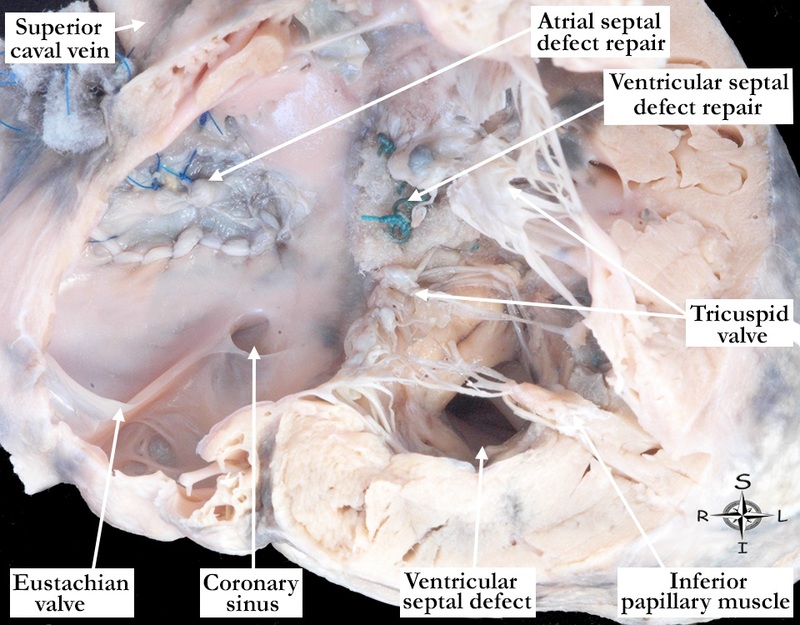 This defect is a deficiency of the atrioventricular component of the membranous septum that permits shunting of blood from the left ventricle to the right atrium. IPCCC Definition A congenital cardiac malformation in which there is complete absence of the interatrial septum in the setting of a common atrioventricular junction (common atrioventricular canal). 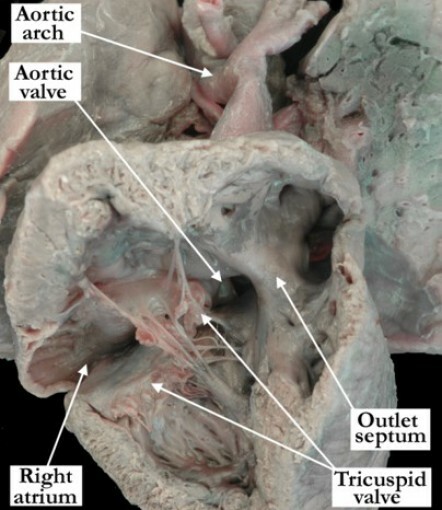 The inferior, lateral wall of the right atrial appendage has been cut and folded away demonstrating a common atrioventricular junction that is guarded by a common atrioventricular valve. 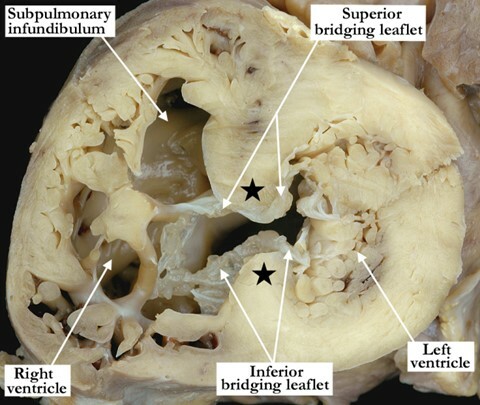 The superior and inferior bridging leaflets are seen crossing the interventricular septum and the coronary sinus is easily visualized within the inferior right atrium. The entire atrial septum is absent with the red dots marking the roof of the common atrial chamber. 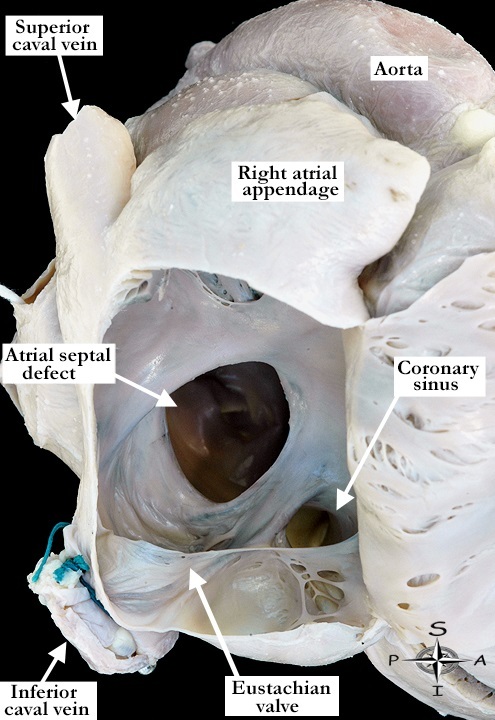 There are concordant atrioventricular connections with a morphologically right atrial appendage anteriorly and the narrow opening of the morphologically left atrial appendage viewed through the common atrium along its posterior aspect. IPCCC Definition A congenital cardiac malformation in association with double inlet ventricle (excluding common atrioventricular valve) in which the atrioventricular valve morphology cannot be determined. This term should be used for the left-sided atrioventricular valve in those hearts. This heart is viewed from posterior to anterior and has been cut in a four chamber echocardiographic plane. 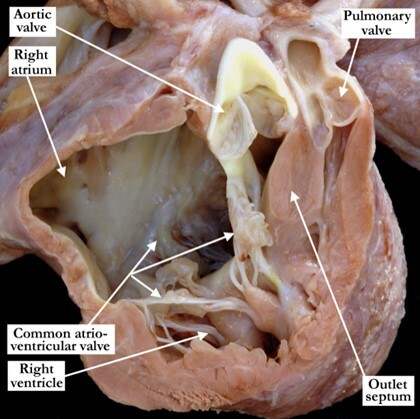 There is a double inlet left ventricle with an abnormality of the left-sided atrioventricular valve. It straddles the interventricular septum with the tension apparatus extending across the ventricular septal defect into the rudimentary, incomplete right ventricle. This heart was explanted following a Fontan procedure. Note the remnant of the right-sided atrial baffle (red star). IPCCC Definition A congenital cardiovascular malformation in which there is near-complete absence of the interatrial septum. 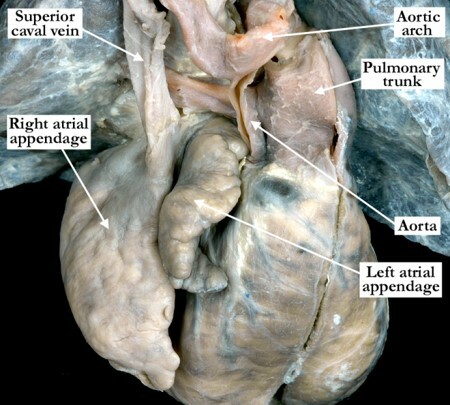 In this postero-inferior view, the inferior aspects of both the right and left atrial chambers have been dissected and lifted away from the base of the heart. The majority of the atrial septum is absent in this heart with separate atrioventricular connections. There is a small portion of the interatrial septum (red dots) remaining near the atrioventricular junctions, rendering this as a common atrium. There are still two atrial chambers. IPCCC Definition A congenital cardiovascular malformation in which a solitary coronary artery supplies the myocardium. In this left anterior lateral view the pulmonary trunk is folded forward and the subpulmonary muscular infundibulum has been dissected. The red dots mark the junction of the pulmonary arterial wall with the infundibular muscle. There is a single coronary artery with the left main coronary artery arising from the proximal right coronary artery and extending between the arterial trunks within the infundibular muscle. 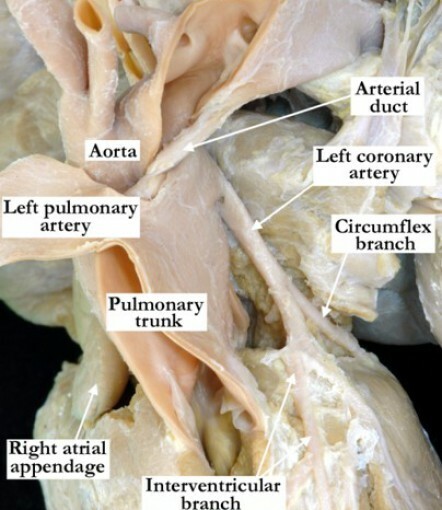 As it emerges from the muscle to the left of the pulmonary trunk, the artery divided in the usual fashion to the anterior interventricular and circumflex branches. The right coronary artery took its usual course within the right atrioventricular groove. IPCCC Definition A congenital cardiovascular malformation in which there is diffuse luminal narrowing of a pulmonary arterial branch (below the lower limit of normal adjusted for body size). The right and left pulmonary arteries in this heart are hypoplastic bilaterally and along their entire length. Image #1 is a left lateral view showing the pulmonary trunk, the hypoplastic left pulmonary artery, the arterial duct (black star) and the aortic arch. The hypoplastic left pulmonary arterial wall is very thin, and it is stenotic along its entire length. 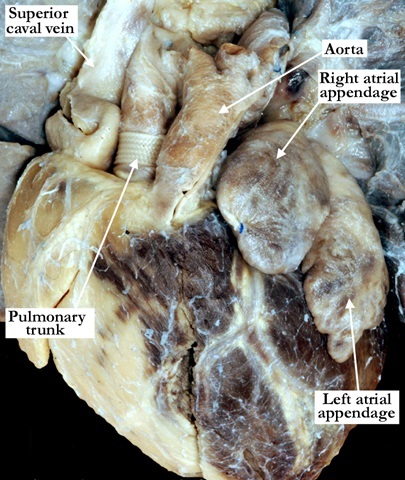 In Image #2, the arterial trunks are folded anteriorly over the ventricular mass, showing the uniform hypoplasia of both the right and left pulmonary arteries as they extend to the hilar regions of the lungs. IPCCC Definition A congenital cardiovascular malformation in which the morphologically right atrium connects to the morphologically right ventricle, the morphologically left atrium connects to the morphologically left ventricle, the morphologically right ventricle connects to the aorta, the morphologically left ventricle connects to the pulmonary trunk, one or more ventricular septal defects are present, and left ventricular outflow tract obstruction is present. In Image #1, the anterior free wall of the right ventricle and the aorta have been removed. 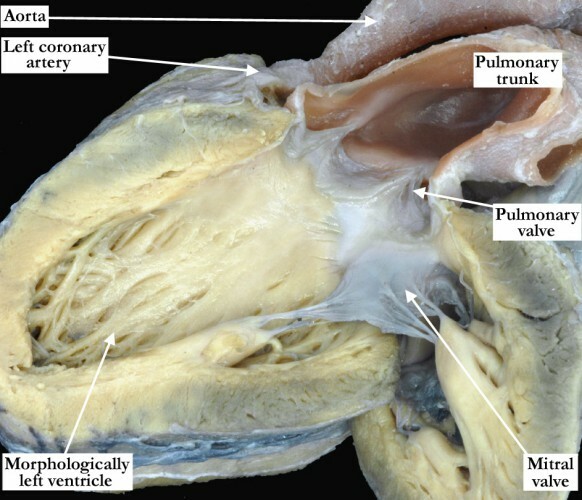 This heart has concordant atrioventricular connections with discordant ventriculo-arterial connections along with a ventricular septal defect and posterior deviation of the outlet septum. 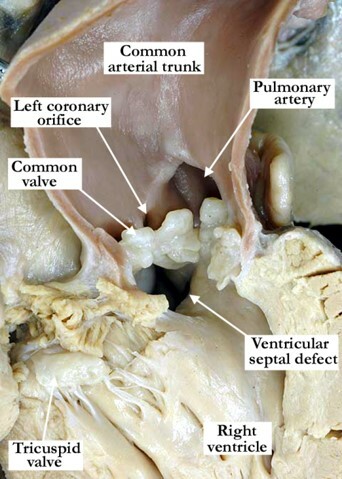 The ventricular septal defect is within the outlet component of the right ventricle and extends to become perimembranous with malalignment of the outlet septum. 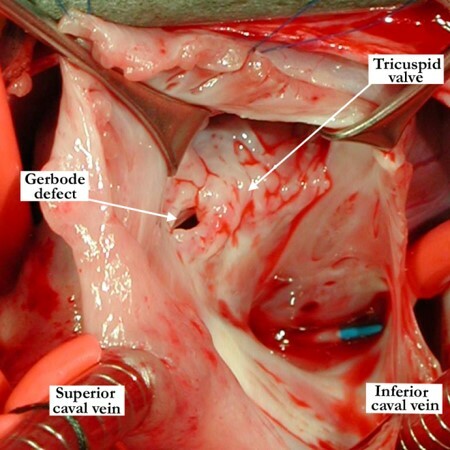 The tendinous cords that support the tricuspid valve extend across the inferior aspect of the defect. Image #2 shows the left ventricular outflow tract from the same heart as in the left panel. The malalignment of the outlet septum narrows the left ventricular outflow tract and causes significant pulmonary stenosis. The pulmonary valve is bicuspid. IPCCC Definition A congenital cardiovascular malformation in which a common arterial trunk is associated with aortic coarctation. IPCCC Definition A congenital cardiovascular malformation in which there is obstruction to flow through the truncal valve due to narrowing or stricture. In this anterior view the right ventricular outflow tract is opened to show the arterial valve in this heart with a common arterial trunk. The valve is quadricuspid, thickened and dysplastic. There is valvar stenosis with post-stenotic dilation of the common trunk. The pulmonary component branches very low from the common trunk, at the sinutubular junction and extending into the adjacent sinus of Valsalva. There is a restrictive, subarterial, muscular ventricular septal defect. IPCCC Definition A congenital cardiovascular malformation in which a coronary artery originates from the pulmonary trunk or one of its branches. 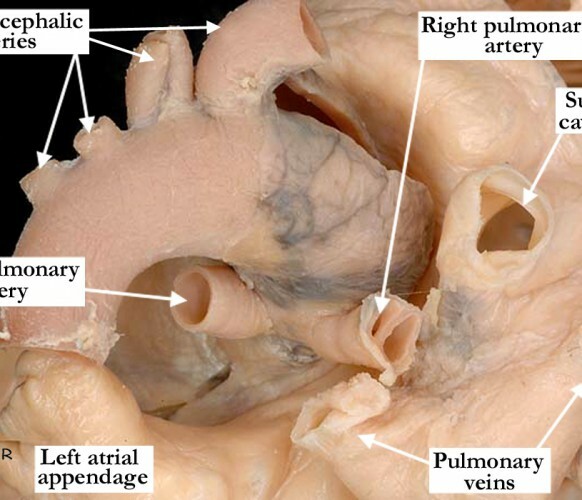 The images are from the same heart, the left-hand image is viewed anteriorly with the pulmonary valve, pulmonary trunk and both right and left pulmonary arteries opened. 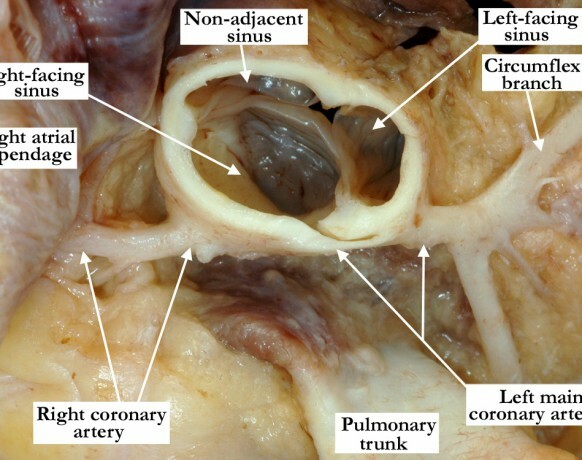 The left coronary orifice arises anomalously from the proximal right pulmonary artery. In the right-hand image the left pulmonary artery is retracted anteriorly to show the origin of the left main coronary artery from the right pulmonary artery. The left main coronary artery has an extremely long course prior to reaching the epicardial surface where it then bifurcates in the usual fashion to the anterior interventricular and circumflex branches. IPCCC Definition A congenital cardiovascular malformation in which there is dilation of a single aortic sinus of Valsalva. Image #1 is a close up, superior view of an opened aortic valve. The right coronary aortic valvar leaflet is retracted with a suture to demonstrate the dilated sinus of Valsalva. The aortic root in this case was poorly supported with a large membranous septum and no muscular support beneath the right coronary leaflet. Only the left coronary leaflet was supported by muscle (not shown). Note the left coronary orifice with its origin near the attachment of the left coronary leaflet at the sinutubular junction. In Image #2, the right atrioventricular junction is viewed anteriorly and in anatomic position. The aneurysm at the atrioventricular junction has been transected. 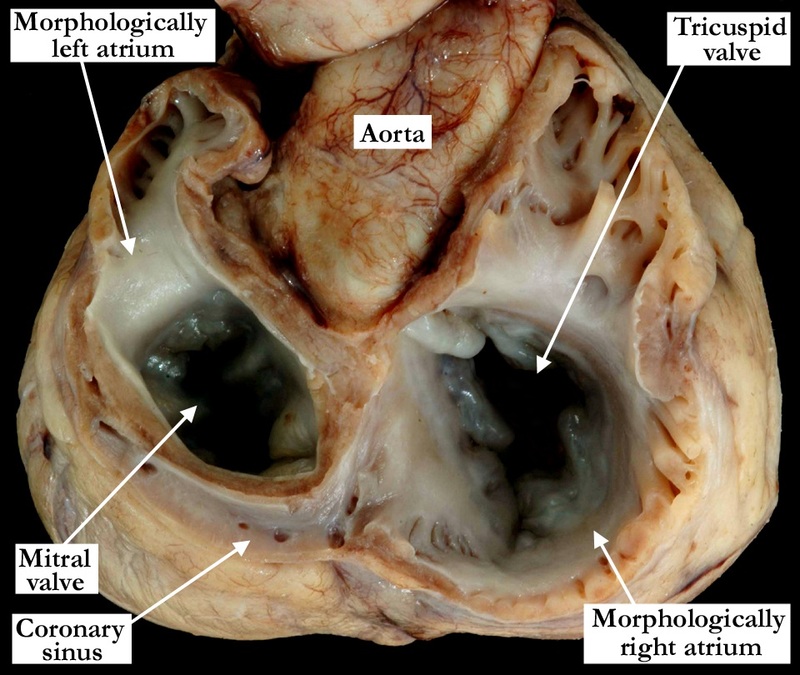 The sectioned atrial myocardium and tricuspid valve demonstrate the close proximity of the aorta, atrioventricular and interventricular components of the membranous septum. The sinus of Valsalva aneurysm caused an ovoid, saccular dilation of the tricuspid valve hinge point that eventually perforated. IPCCC Definition A congenital cardiac malformation in which there is a ventricular septal defect that opens to the outlet of the right ventricle, with a muscular postero-inferior border when viewed from the right ventricle, and in which the fibrous outlet septum, or the area of continuity between the aortic and pulmonary valves, is malaligned in postero-caudal fashion relative to the apical part of the muscular septum such that there is obstruction to the left ventricular outflow tract. In Image #1, the pulmonary outflow is viewed anteriorly, in anatomic position. 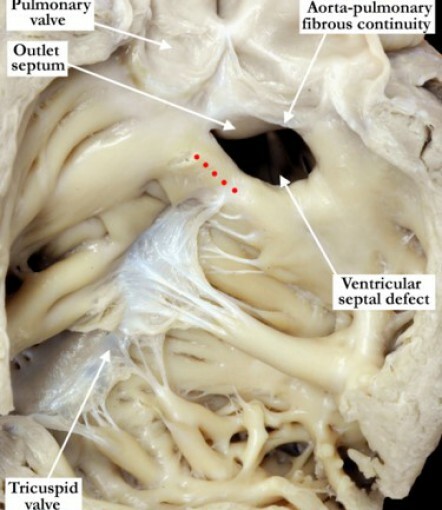 There is a ventricular septal defect that opens to the outlet of the right ventricle, with a muscular postero-inferior border (red dots) when viewed from the right ventricle. The area of fibrous continuity between the aortic and pulmonary valves is malaligned in postero-caudal fashion along with the adjacent muscular portion of the outlet septum, such that there is obstruction to the left ventricular outflow tract. In Image #2 the left ventricular outflow of the same heart shown in the left hand image demonstrates the left ventricular outflow tract viewed posteriorly and in anatomic position. 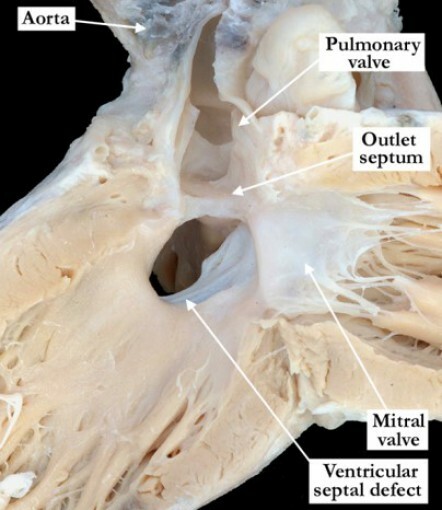 The muscular component of the outlet septum joins the area of fibrous continuity between the pulmonary and aortic valves and is deviated in a postero-caudal direction causing left ventricular outflow tract obstruction. IPCCC Definition A congenital cardiovascular malformation in which there is a ventricular septal defect that 1) occupies the space that is usually closed by the interventricular part of the membranous septum, 2) is adjacent to the area of fibrous continuity between the leaflets of an atrioventricular valve and an arterial valve, and 3) is located at the center of the base of the ventricular mass. 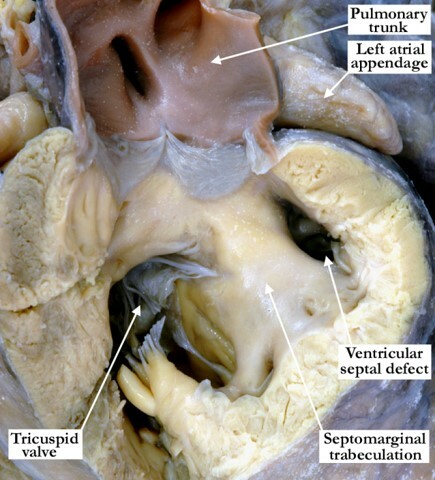 In the first image, the central ventricular septal defect lies at the apex of the triangle of Koch and the supraventricular crest is normally inserted between the limbs of the septomarginal trabeculation. The defect opens inferiorly and posteriorly to the supraventricular crest and the medial papillary muscle (red star) is along its superior-most border. In the second image the roof of the defect is formed by a remnant of the interventricular component (red dots) of the membranous septum. The mitral valve does not come into contact with the borders of the defect. IPCCC Definition A congenital cardiac malformation in which the left atrial appendage extends from the left atrium, behind the great arteries, to lie adjacent to the right atrial appendage. 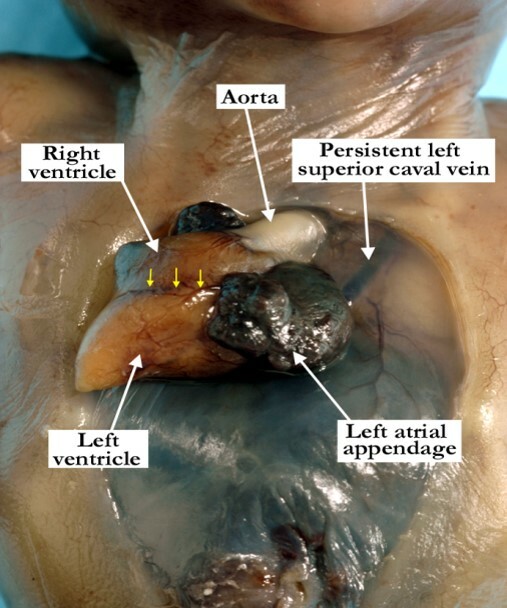 This anterior anatomic view demonstrates juxtaposition of the atrial appendages with the left atrial appendage extending from the left atrium, posterior to the arterial pedicle, to lie adjacent to the right atrial appendage and to the right side of the great arteries. This is commonly associated with hypoplasia or atresia of the mitral valve, hypoplasia of the left ventricle and aortic valvar stenosis or atresia. Note the severe hypoplasia of the ascending aorta in this heart with a hypoplastic left ventricle (not shown). IPCCC Definition A congenital cardiac malformation in which the right atrium is partially divided by a large or obstructive Eustachian valve. The images are from the same heart and demonstrate a right atrium which is partially divided by a large, nearly obstructive Eustachian valve. In the first image, the large Eustachian valve is attached to a prominent terminal crest. 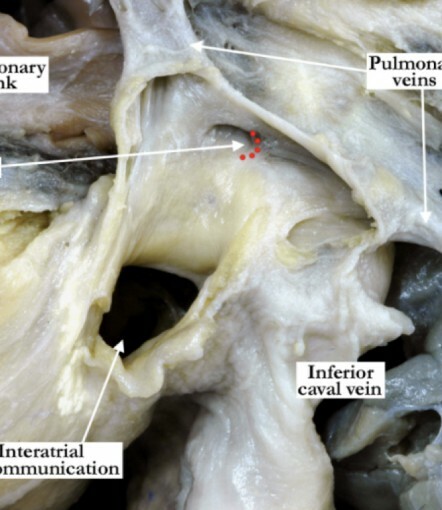 The terminal crest is free standing as it crosses the opening of the superior caval vein (black arrow). Only the anterior-most portion of the oval fossa can be visualized. In the second image, the venous component of the right atrium shows the normal connections of the superior and inferior caval veins. 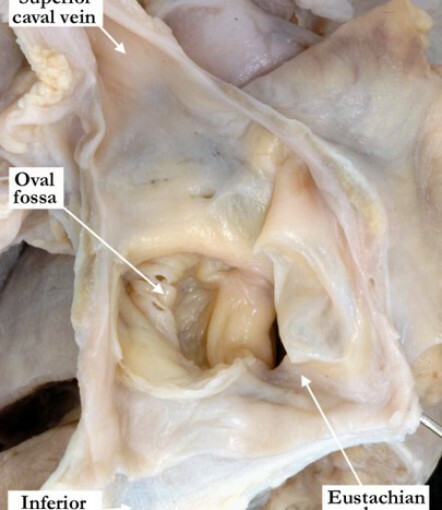 The oval fossa is easily visualized along with the prominent Eustachian valve that nearly divides the right atrium. IPCCC Definition A congenital cardiac finding in which the septum primum is abnormally large (redundant) and results in aneurysmal protrusion into one or both atria. The right atrium and ventricle have been opened in clam-shell fashion and this anterior view of the atrial septum demonstrates an abnormally large, redundant flap valve (primary atrial septum) at the floor of the oval fossa resulting in aneurysmal protrusion into the right atrium. The tricuspid valve guards the inlet of the right ventricle. IPCCC Definition A congenital cardiovascular malformation in which there is more than one connection of the hepatic veins to the heart. 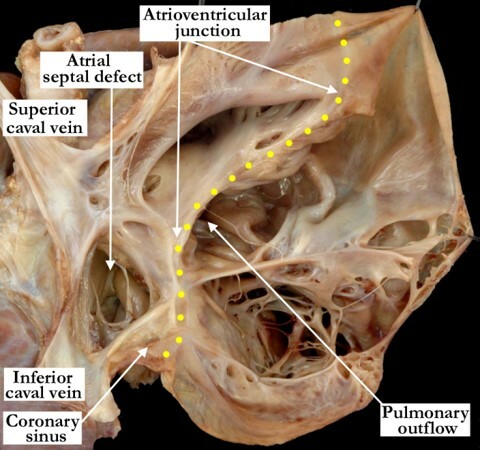 This anterior view of the right atrial junction with the inferior caval vein demonstrates a congenital cardiovascular malformation in which there is more than one connection of the hepatic veins to the heart. 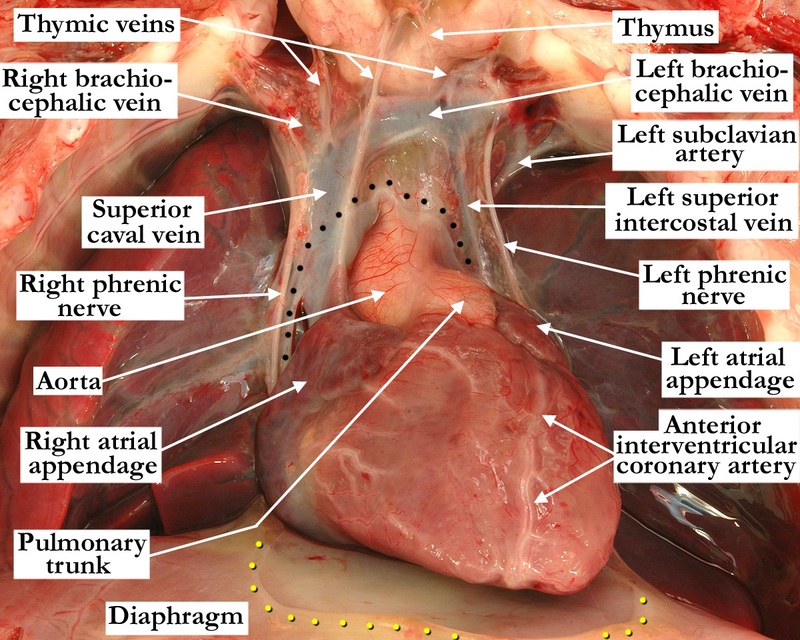 The anterior aspect of the liver has been transected to demonstrate the venous connections. There is a fenestrated flap valve at the floor of the oval fossa and a vestibular atrial septal defect. 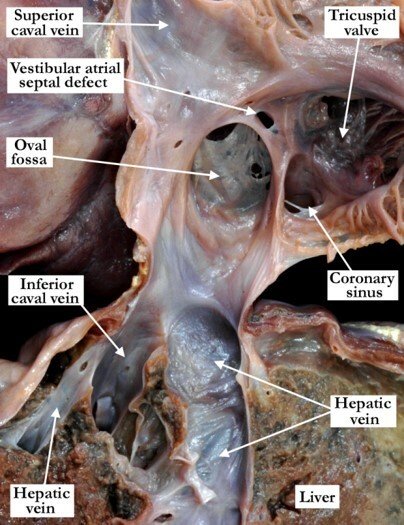 IPCCC Definition A congenital cardiovascular malformation in which there is a left superior caval vein (superior vena cava) connecting directly to the left-sided atrium. The left atrium is opened posteriorly and viewed in anatomic position. 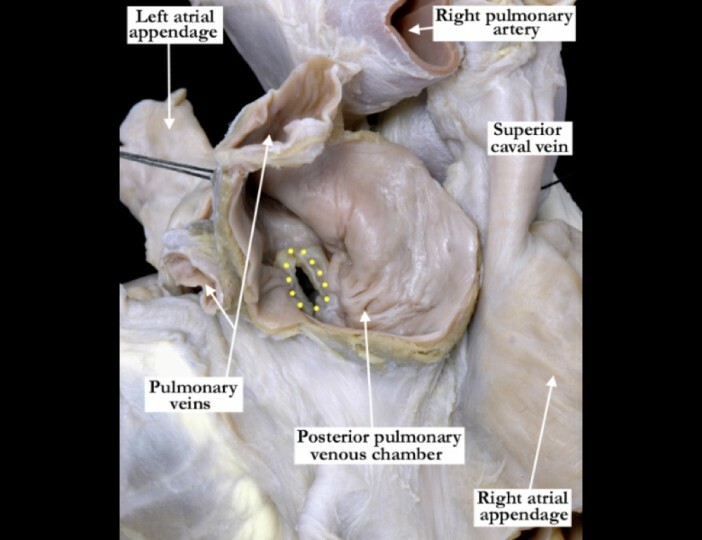 A persistent left superior caval vein (PLSCV) drains to the roof of the left atrium with direct communication to the left atrial chamber between the appendage and the left pulmonary veins. This is typically referred to as unroofing of the coronary sinus. There is a prominent ridge (yellow dots) at the vein’s entrance to the left atrial roof and the tip of a probe is seen at the opening. The red dotted lines mark the position of the walls that would typically separate the persistent left superior caval vein from the left atrium. The coronary sinus is large and in this instance functions as an interatrial communication. IPCCC Definition A congenital cardiac malformation of the tricuspid valve in which there is annular hypoplasia (incomplete development or underdevelopment so that it is abnormally small [below the lower limit of normal adjusted for body size]). Hypoplasia may or may not be associated with stenosis. 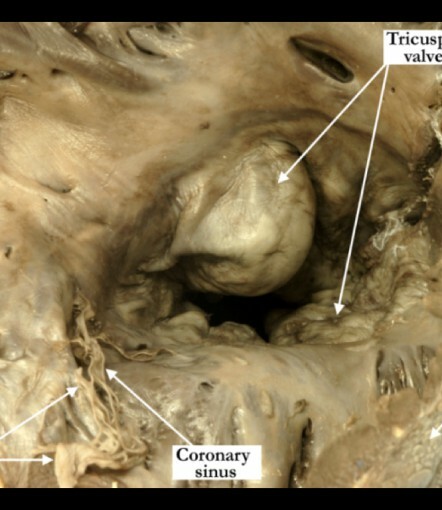 This heart is viewed from the base after removal of the large part of the atrial walls and illustrates severe hypoplasia of the tricuspid valve annulus. This heart has pulmonary atresia with intact ventricular septum (not demonstrated in this image). The pulmonary truck is tiny when compared to the aorta. IPCCC Definition A congenital cardiovascular malformation in which a common arterial trunk is associated with an interrupted aortic arch. 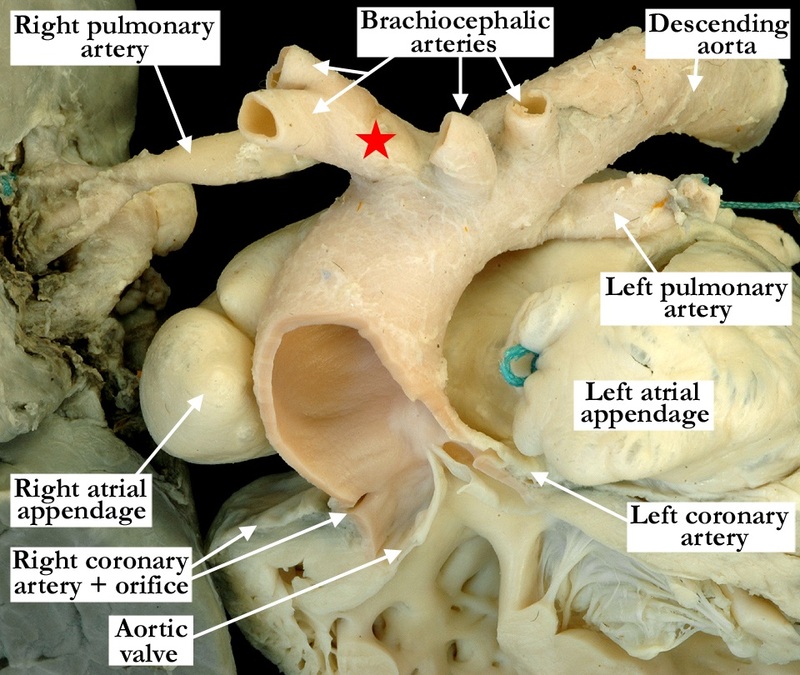 This anterior view illustrates single outlet of the heart via a pulmonary dominant common arterial trunk with an interrupted aortic arch (double headed red arrow) between the left carotid and left subclavian arteries. Both carotid arteries branch from the short segment of ascending aorta. The yellow star marks the right subclavian artery which arises distally from the arch, eventually taking a retroesophageal course (not shown). 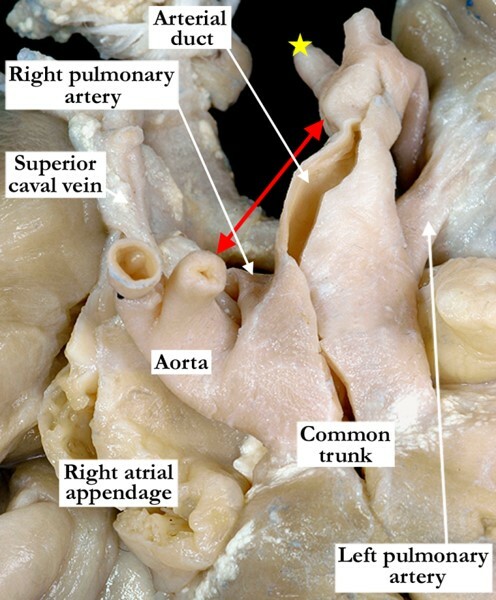 Note the pulmonary component of the common trunk continues through a large arterial duct to reach the descending aorta. IPCCC Definition A congenital cardiac malformation of the mitral valve in which the anterior leaflet is divided into two parts. 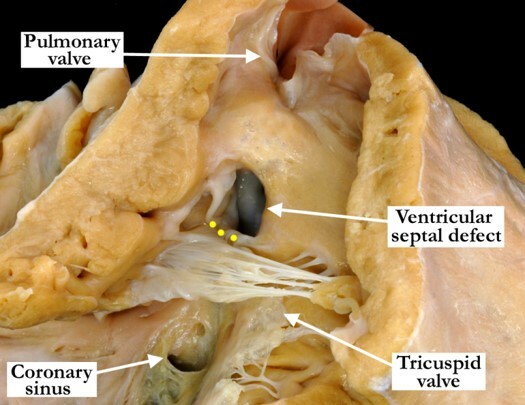 The left ventricle is viewed posteriorly and is opened in a clam-shell fashion illustrating a cleft in the anterior or aortic leaflet of the mitral valve (yellow arrow). The cleft points to the aortic outflow or aortic valve (yellow dashed arrow) and not to the interatrial septum. 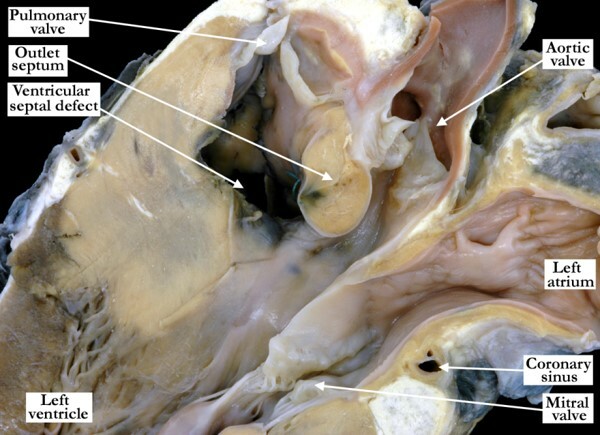 In this heart there is a perimembranous ventricular septal defect with a few tendinous cords straddling the interventricular septum and supporting the mitral valve from within the right ventricle. IPCCC Definition A congenital cardiac malformation in which the right atrial appendage extends from the right atrium, behind the great arteries, to lie adjacent to the left atrial appendage. This left, postero-lateral view demonstrates juxtaposition of the atrial appendages. The right atrial appendage extends from the right atrium, posteriorly to the arterial pedicle, to lie adjacent and superiorly to the left atrial appendage. IPCCC Definition A congenital cardiovascular malformation in which the heart is at least partially outside of the thorax. This is an anterior view of the chest wall in a stillborn fetus at 18 weeks gestation with exteriorization of the heart. The heart is exteriorized because of the deficiency of the surrounding thoraco-abdominal wall. 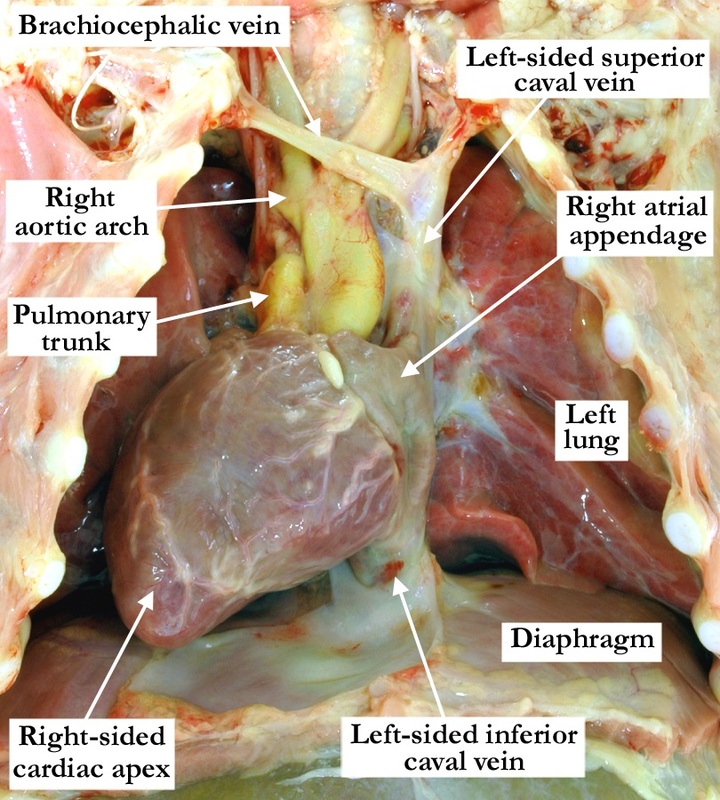 The cardiac apex is to the right, the left atrium is markedly dilated and the persistent left superior caval vein is easily visualized through the thin thoracic membrane. Internal examination revealed tetralogy of Fallot ,with a small right ventricle that did not extend to the apex of the heart. Note the anterior interventricular coronary artery marked with yellow arrows. IPCCC Definition A congenital cardiac malformation that includes any structural abnormality of the mitral valvar leaflet(s), commonly consisting of leaflet thickening and restricted mobility. In Image #1, this postero-superior view of the left atrioventricular junction demonstrates a stenotic, thickened, dysplastic mitral valve. The inferior horn of the flap valve is marked with red dots. 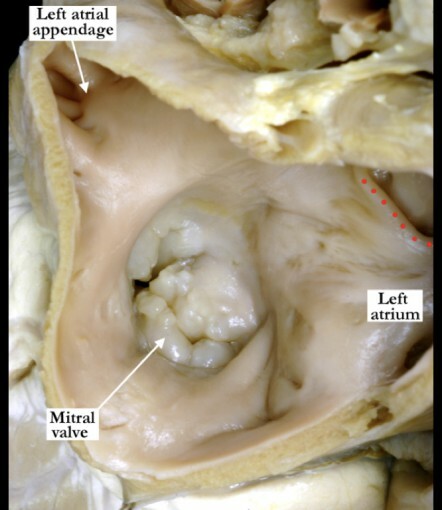 In Image #2, the left atrioventricular junction is opened and viewed posteriorly, demonstrating a thickened, dysplastic mitral valve. All of the leaflets are supported by thickened, fused tendinous cords. IPCCC Definition A congenital cardiac finding in which there is backward flow through the tricuspid valve. In Image #1, the right atrium and ventricle are opened in clam-shell fashion and viewed anteriorly in anatomic position. 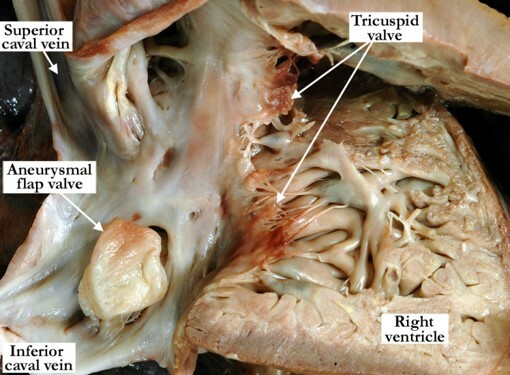 The right atrioventricular junction is guarded by a dysplstic and regurgitant tricuspid valve. All of the leaflets are redundant with a dilated, ballooned appearance in some areas. The tendinous cords are elongated. In image #2, the superior lateral view of the tricuspid valve inlet demonstrates a balloon-like anterior leaflet. 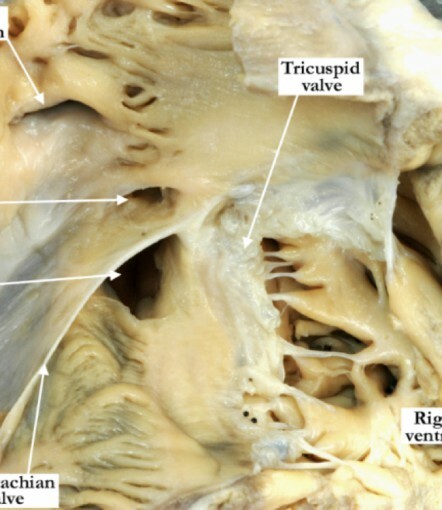 The tricuspid valve does not occlude properly the atrioventricular orifice. IPCCC Definition A congenital cardiac malformation in which the tricuspid valve annulus lies in part above both the right and left ventricles. Image #1 the right atrium and ventricle are opened in clam-shell fashion and are viewed anteriorly. 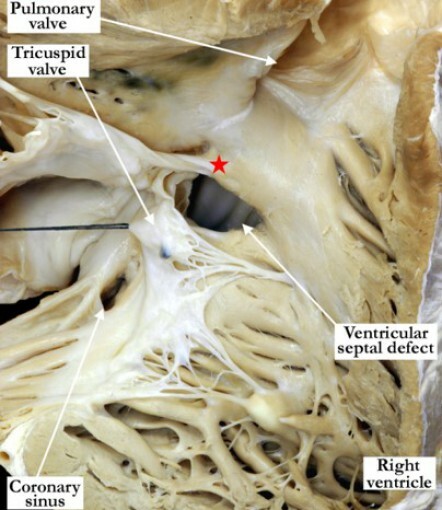 The right atrioventricular junction is shown with a perimembranous ventricular septal defect beneath the septal leaflet of the tricuspid valve (red dots). The defect essentially divides the septal leaflet with the portion adjacent to the hinge point of the valve overriding the ventricular septum. 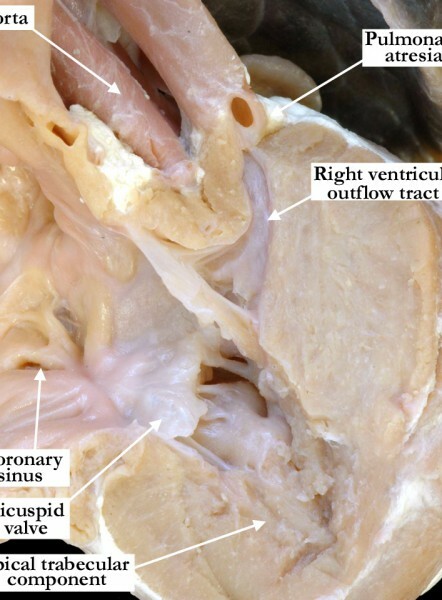 Image #2 is a posterior view of the left ventriculo-arterial junction and demonstrates the overriding tricuspid valve with a portion of the tricuspid valve annulus lying in part above the left ventricle. 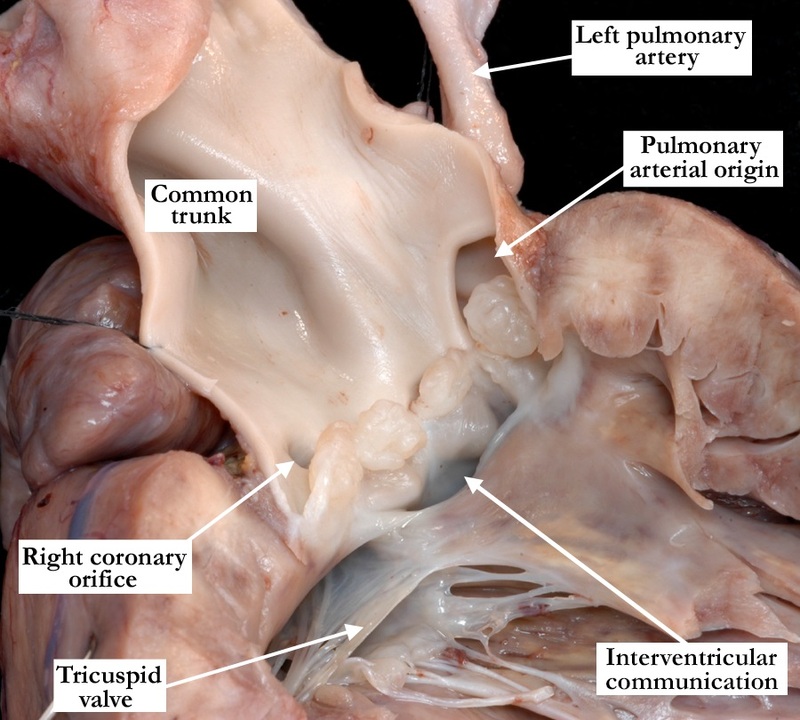 Note that there are no tendinous cords supporting the tricuspid valve within the left ventricle. IPCCC Definition A congenital cardiovascular malformation in which there is a communication between the left atrium and the coronary sinus allowing interatrial communication through the coronary sinus ostium. 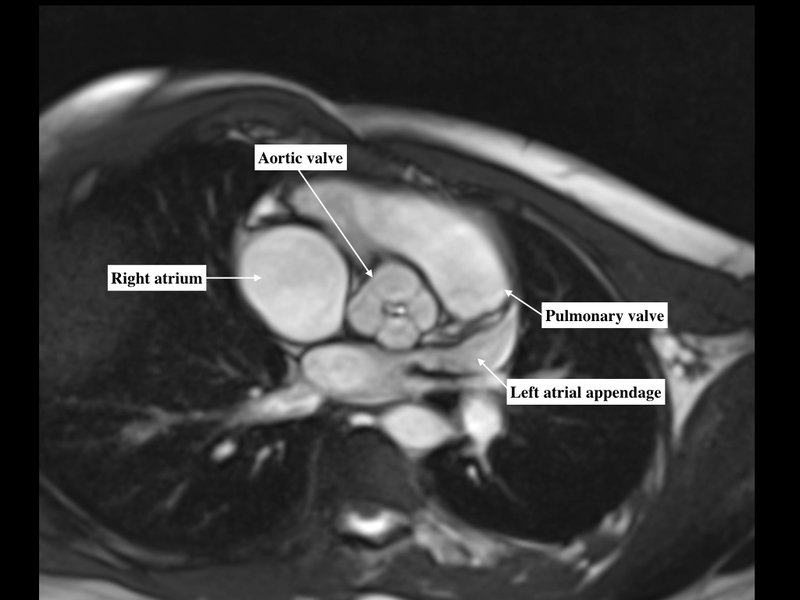 Image #1 is viewed anteriorly demonstrating the septal surfaces of an opened right atrium and ventricle with a large coronary sinus orifice, acting as an interatrial communication. The oval foramen was restrictive with premature closure. Image #2 is a posterior view of the left side of the same heart. The left atrium and ventricle are hypoplastic and the pulmonary veins are normally connected. The typical horseshoe attachment of the flap valve within the left atrium is marked with red dots. There is a large interatrial communication at the coronary sinus. In this case the interatrial communication is not associated with a persistent left superior caval vein. IPCCC Definition A congenital cardiac malformation in which a ridge of tissue is attached or integral to the atrial side of the mitral valvar leaflet(s). 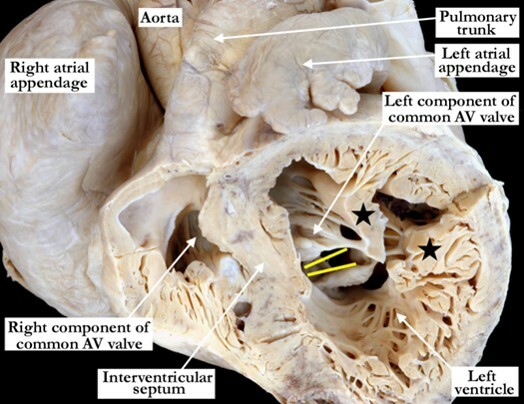 Left Panel: This postero-superior view of the left atrioventricular junction shows a prominent, supravalvar ring (yellow dots) associated with the atrial aspect of the mitral valve. This ring is above the annulus or hinge point of the valve. 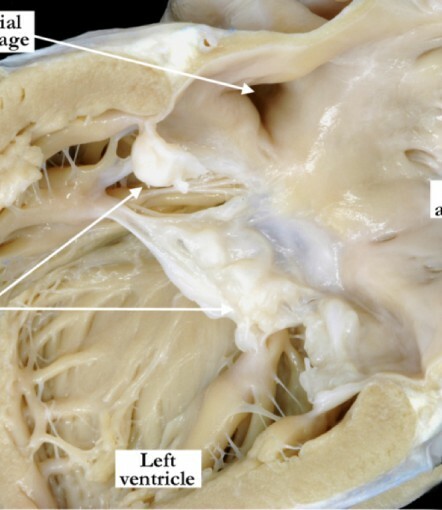 Right Panel: The left atrioventricular junction is opened and viewed posteriorly, demonstrating a thickened mitral valve with thickened fused tendinous cords. 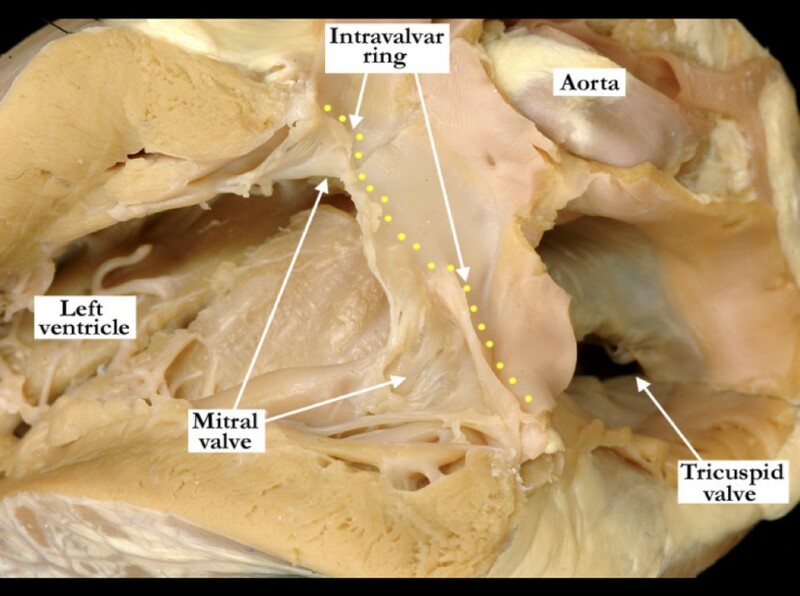 Within the funnel of the mitral valve there is a prominent intravalvar ring (yellow dots). IPCCC Definition A congenital cardiac malformation in which there is a partition that divides the left atrium into a posterior chamber that receives some or all of the pulmonary veins and an anterior chamber that communicates with the left atrial appendage and atrioventricular junction (usually the mitral valve). 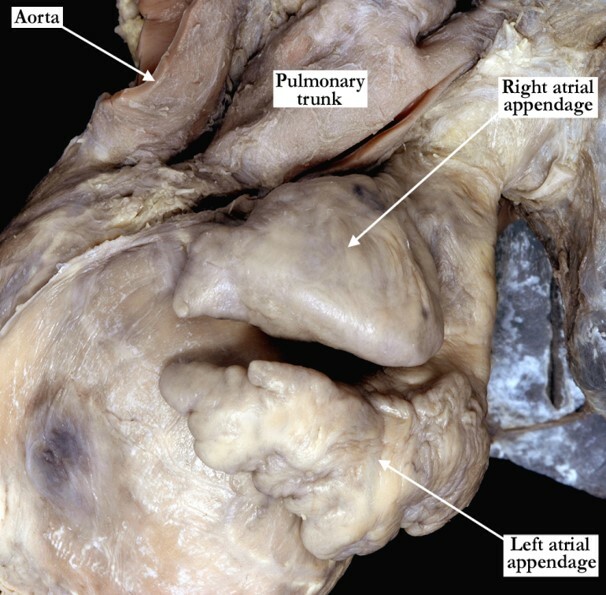 The left panel shows a posterior view of an opened left atrial chamber and the pulmonary veins connecting to a posterior chamber. The yellow dashed arrow illustrates the path of the pulmonary venous drainage from the posterior chamber to the left atrial vestibule. 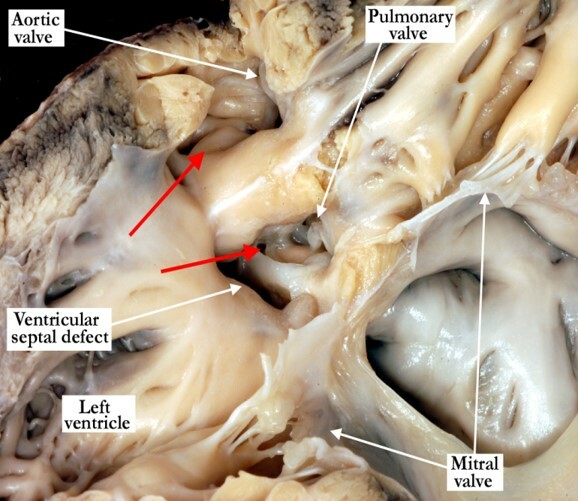 The opened mitral valve guards the left atrioventricular junction. In the right panel this postero-superior view shows the partition dividing the posterior left atrial chamber from the atrial vestibule. The pulmonary veins drain into the atrial vestibule via a small opening (yellow dots) in the floor of the partition that divides the left atrium. IPCCC Definition A congenital cardiovascular malformation with narrowing of the aorta at the level of the sinotubular junction which may extend into the ascending aorta. Image # 1 is an anterior superior view of the aortic root as it exits the ventricular mass there is marked dilation of the sinuses of Valsalva secondary to a fibrous membrane present internally at the level of the sinotubular junction (red dots). In image # 2 the left ventricular outflow tract and the aortic root shows subvalvar and supravalvar aortic stenosis in this patient noted to have Shone’s syndrome. The subvalvar stenosis is caused by a prominent fibrous ridge that is circumferential and extends over the aorta to mitral fibrous continuity. At the sinotubular junction (red dots) there is a fibrous shelf accounting for the distal valvar stenosis. Although this is the lesion that is commonly defined as being “supravalvar”, it is in fact a valvar lesion since the “commissures”, or the peripheral attachments of the leaflets, are part of the valvar mechanism. The sinuses of Valsalva are markedly dilated (not seen in this image) with the right and non-adjacent leaflets tethered to the fibrous shelf. IPCCC Definition A congenital cardiac malformation in which there is a ventricular septal defect that opens to the outlet of the right ventricle, with exclusively muscular borders when viewed from the right ventricle, and in which the muscular outlet septum is malaligned in postero-caudal fashion relative to the apical part of the muscular septum such that there is obstruction to the left ventricular outflow tract. This heart has been sectioned along the long axis and is viewed from the left posterior lateral aspect. A ventricular septal defect (interventricular communication) opens to the outlet of the right ventricle, with exclusively muscular borders. The muscular outlet septum is malaligned in postero-caudal fashion relative to the apical part of the muscular septum causing obstruction to the left ventricular outflow tract. IPCCC Definition A congenital cardiac malformation in which there is a ventricular septal defect with exclusively muscular borders that opens to the outlet of the right ventricle, and in which the muscular outlet septum is aligned with the apical part of the muscular septum. 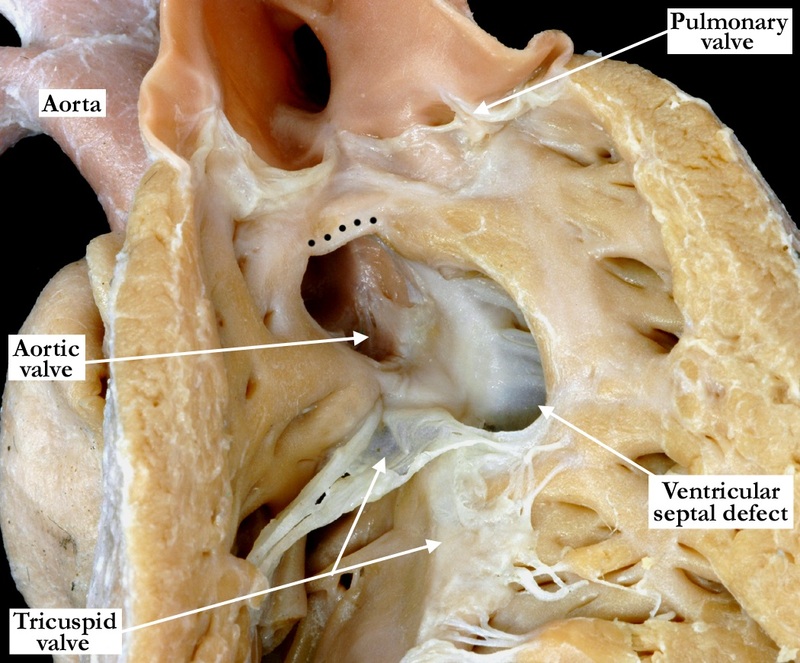 In this anterior view, the free wall of the right ventricle has been lifted away to view the septal surface. There is a ventricular septal defect (interventricular communication) that extends into the outlet component with no septal malalignment. 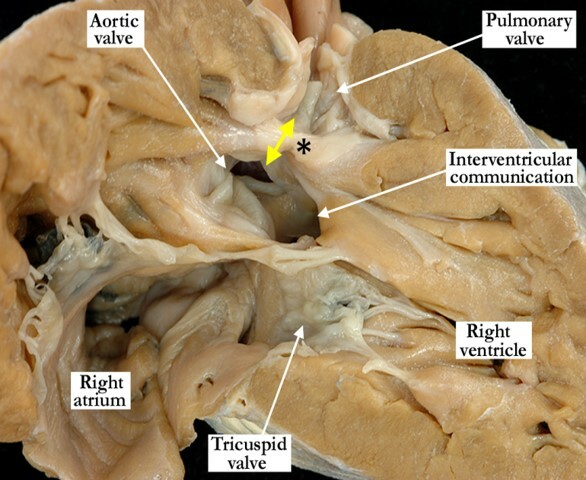 In this case the defect is muscular with the postero-caudal arm (yellow dots) of the septal band extending to the ventriculo-infundibular fold, effectively separating the atrioventricular valve from the arterial valve. IPCCC Definition A congenital cardiac malformation in which there is a ventricular septal defect that opens to the outlet of the right ventricle. 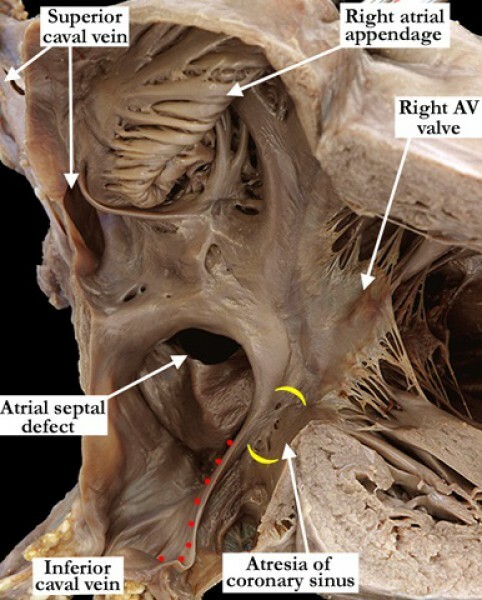 In this anterior view, the free wall of the right ventricle has been lifted away from the septal surface demonstrating a perimembranous ventricular septal defect (interventricular communication). The defect extends into the outlet component of the right ventricle without malalignment of the outlet septum. The yellow dots mark the fibrous continuity between the tricuspid and aortic valves, rendering this defect perimembranous. IPCCC Definition A congenital cardiac malformation in which there is one or more small, clinically insignificant ventricular septal defect(s) in the absence of flow-related cardiac chamber dilation or abnormal elevation of pulmonary arterial pressure. This heart is viewed from posterior to anterior and has been sectioned to demonstrate all four chambers and the septal structures. 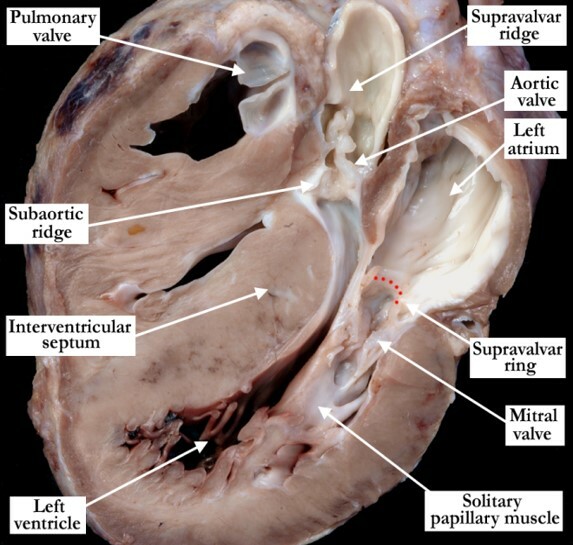 The image shows the anterior half of the heart with a small, slit-like, mid septal, muscular ventricular septal defect (interventricular communication). This defect was clinically insignificant and was an incidental finding at autopsy. IPCCC Definition A congenital cardiac malformation in which there is a ventricular septal defect within the apical component of the muscular ventricular septum. The free wall of this hypertrophied right ventricle has been lifted rightward to expose the outlet component and is viewed anteriorly. 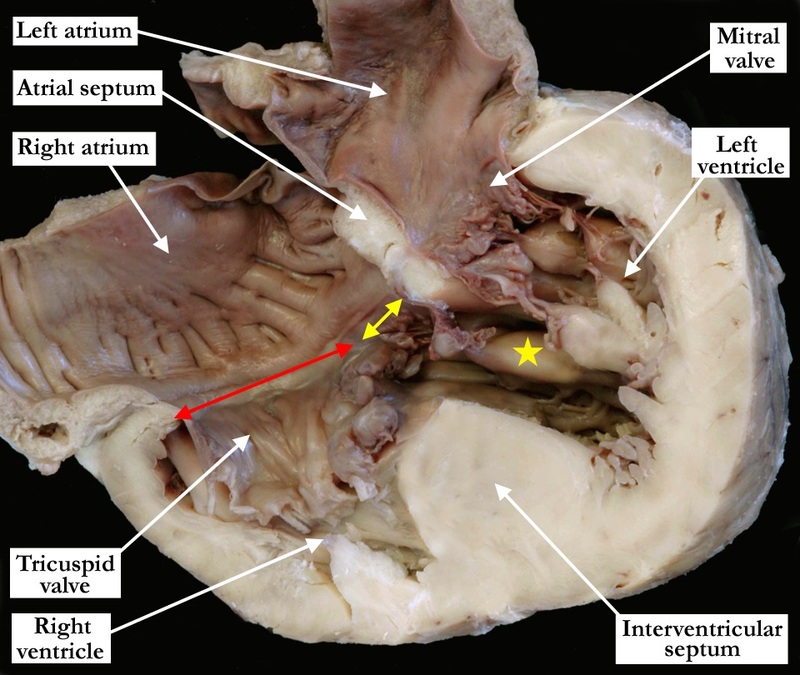 There is a muscular ventricular septal defect (interventricular communication) that opens to the anterior part of the right ventricle, and is antero-superior (or cephalad) to the body of the septomarginal trabeculation, or septal band. IPCCC Definition A congenital cardiac malformation in which there is a ventricular septal defect that opens to the right ventricle within the central component of the muscular ventricular septum. 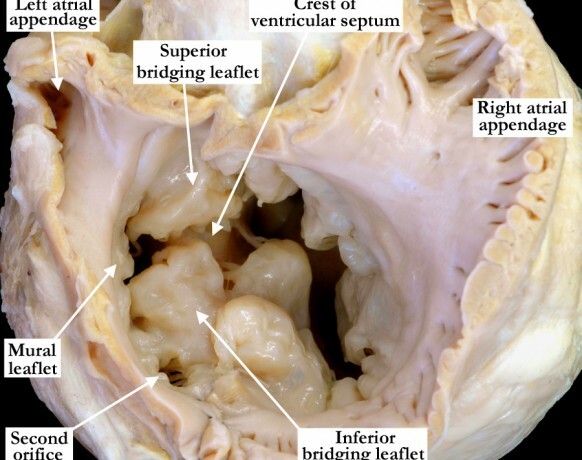 The right ventricle is viewed in anterior, anatomic position and has been opened in clam-shell fashion to demonstrate a muscular ventricular septal defect (interventricular communication) in the apical or trabecular component of the interventricular septum. IPCCC Definition A congenital cardiac malformation in which there are deep, endothelial lined, blind-ended intramyocardial tunnels communicating with the left ventricular chamber. These occur in the setting of aortic atresia or severe left ventricular outflow tract obstruction, intact ventricular septum and a patent mitral valve. This heart has been sectioned along the long axis and is viewed from the left posterior lateral aspect. 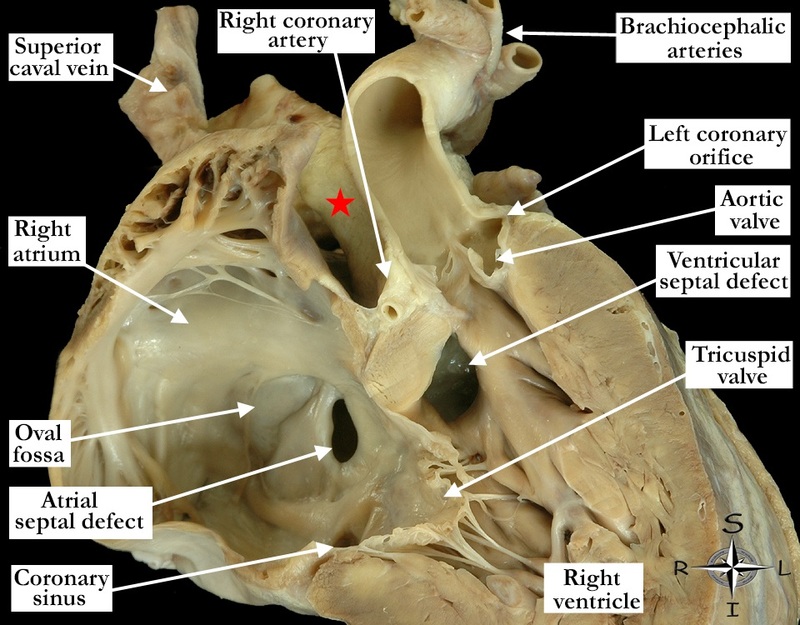 The left side of the heart demonstrates the features of Shone’s syndrome. There is marked endocardial fibroelastosis of the left atrium with a supravalvar mitral ring (red dots). 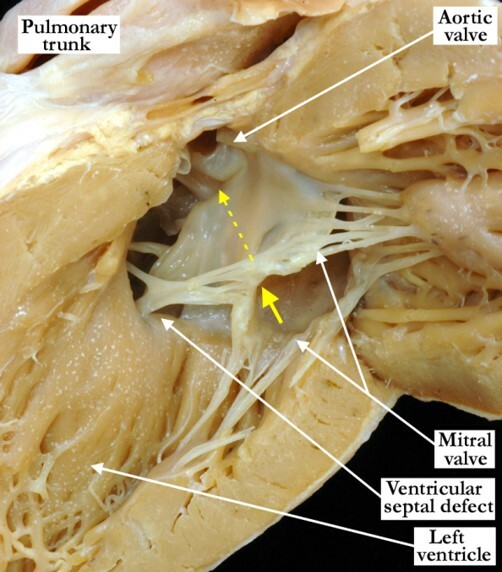 The mitral valve is extremely stenotic and thickened with fused tendinous cords. There is a parachute mitral valve with a solitary papillary muscle. There is subvalvar aortic stenosis caused by a prominent fibrous ridge that was circumferential along with a prominent, subaortic, septal bulge. At the sinutubular junction there is a supravalvar ridge accounting for the supravalvar stenosis. The aortic valve is bicuspid. IPCCC Definition A congenital cardiac malformation in which the flow through the left ventricular outflow tract is blocked or impeded due to abnormal position or attachments of tricuspid, mitral, or common atrioventricular valvar tissue. 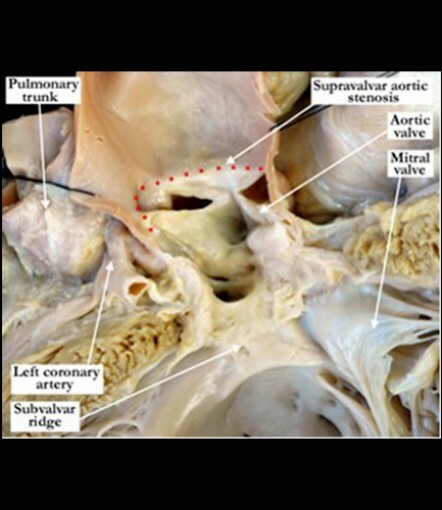 In this posterior view, the left ventricle has been opened with the free wall lifted away from the septal surface. The flow through the left ventricular outflow tract, proximal to the aortic valve, is impeded by a tag of tricuspid valvar tissue that extends through the perimembranous ventricular septal defect. IPCCC Definition A congenital cardiac condition in which the flow through the left ventricular outflow tract (proximal to the valve[s] guarding the outflow from the left ventricle) is blocked or impeded. This heart was sectioned along the long axis of the heart and is viewed from left posterior lateral aspect. 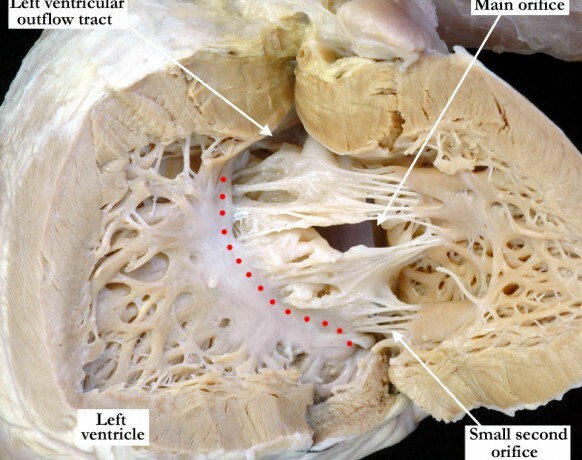 The left side of the heart demonstrates subaortic stenosis secondary to asymmetric septal hypertrophy in this patient with hypertrophic cardiomyopathy. IPCCC Definition A congenital cardiac malformation that is a variant of an atrioventricular septal defect (atrioventricular canal defect) with the left ventricle significantly larger than the right. 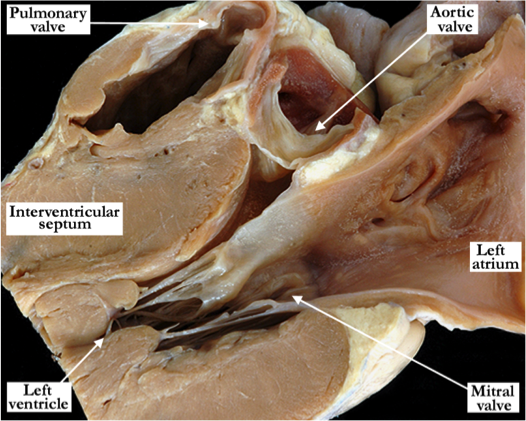 This heart has been sectioned to demonstrate the short axis of the ventricular mass. It is photographed to show the view from the apex looking towards the base. There is an atrioventricular septal defect with a common atrioventricular junction. The common atrioventricular valve is committed predominately to the left ventricle, resulting on left ventricular dominance. 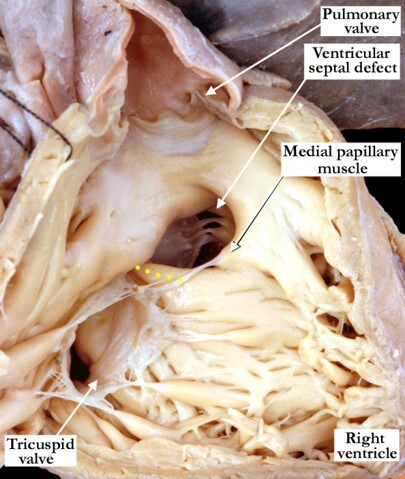 The papillary muscles (black stars) are close together within the left ventricle, which shows excessive trabeculations. The zone of apposition between the superior and inferior bridging leaflets is marked with the yellow lines. The right ventricular cavity is hypoplastic as is the right component of the common atrioventricular valve. IPCCC Definition A congenital cardiac malformation in which the right atrium is severely dilated. This is an isolated finding not secondary to abnormalities of the tricuspid valve or right ventricle. Image # 1 demonstrates he anterior anatomic view of a grossly dilated right atrium. Image # 2 shows the heart an anterior view of the heart with an opened right atrium, demonstrating marked dilation of the appendage and atrial chamber. The oval foramen is probe patent without appreciable dilation of the flap valve. 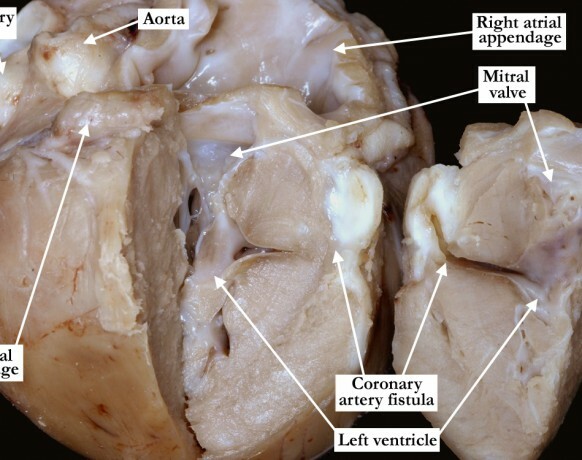 There are concordant atrioventricular and ventriculo-arterial connections without abnormalities of the atrioventricular or arterial valves. IPCCC Definition A congenital cardiac malformation with both an atrioventricular septal defect (atrioventricular canal defect) and tetralogy of Fallot. 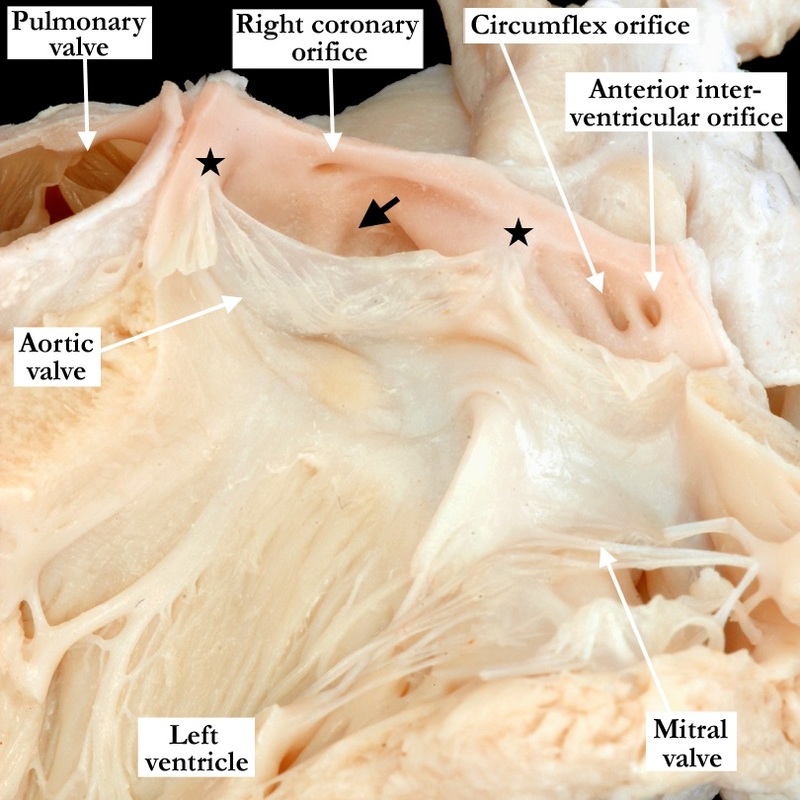 This heart is viewed in an anterior anatomic position and has been sectioned to illustrate the left and right ventricular outflow tracts and common atrioventricular valve. The specimen is photographed from the front, simulating the subcostal long-axis echocardiographic plane. There is antero-cephalad deviation of the outlet septum producing severe subpulmonary infundibular and valvar stenosis. 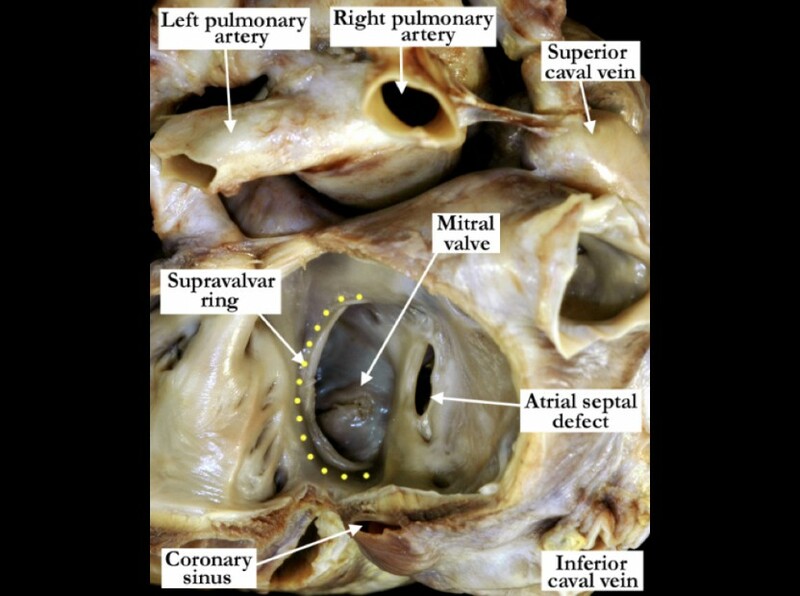 The aortic valve overrides the interventricular septum in this heart with tetralogy of Fallot. There is also an atrioventricular septal defect with a common atrioventricular junction and valve. IPCCC Definition A congenital cardiac malformation that is a form of atrioventricular septal defect (atrioventricular canal defect) with the right ventricle significantly larger than the left. 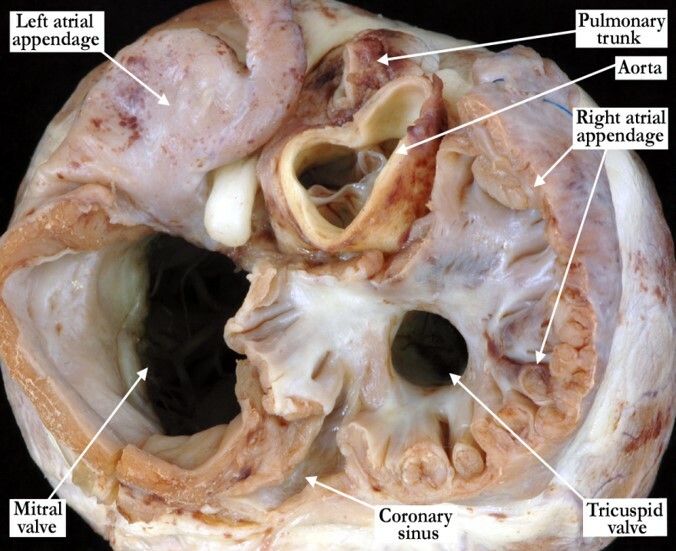 This heart has been sectioned to demonstrate the short axis of the ventricular mass. It is photographed to show the view from the apex looking towards the base. There is an atrioventricular septal defect with a common atrioventricular junction. The common atrioventricular valve is committed predominately to the right ventricle, producing right ventricular dominance. 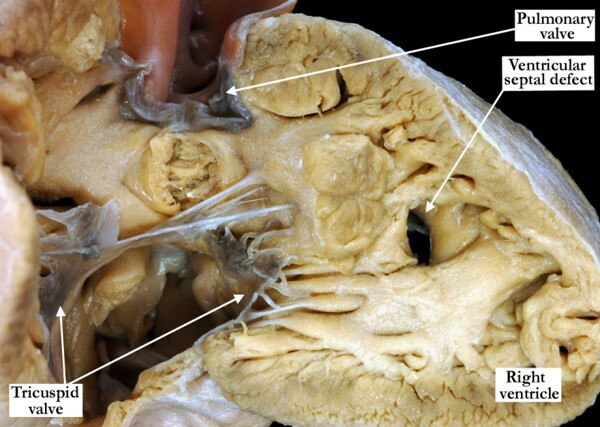 The left ventricle is hypoplastic, with excessive trabeculations and closely adjacent papillary muscles. The superior and inferior portions of the deficient muscular ventricular septum are marked with the black stars. IPCCC Definition A congenital cardiovascular malformation in which the aortic root or its remnant is positioned directly to the left of the pulmonary root or its remnant. This anterior view demonstrates the heart in anatomic position. 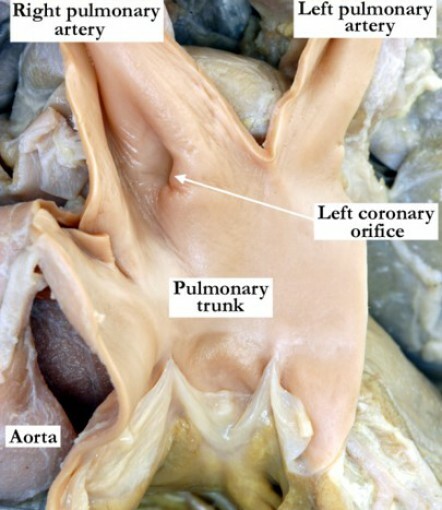 The cardiac apex, not shown in this image, is directed to the right. The aortic root is positioned side by side and directly leftward of the pulmonary root. IPCCC Definition A congenital cardiovascular malformation in which the aortic root or its remnant is positioned directly to the right of the pulmonary root or its remnant. A portion of the anterior, right ventricular free wall has been removed to demonstrate the relationships of the arterial trunks. 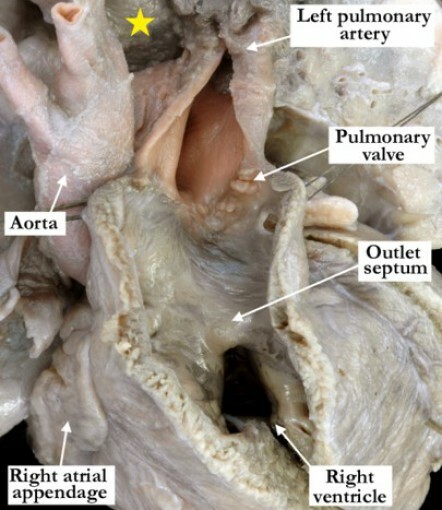 The aortic root is positioned directly to the right of the pulmonary trunk in this heart with ventriculo-arterial connection of double outlet right ventricle. The arterial trunks are side by side and both are supported by a complete, subarterial muscular infundibulum. Note the right ventricular hypertrophy and the restrictive ventricular septal defect (interventricular communication). IPCCC Definition A congenital cardiovascular malformation with partial anomalous pulmonary venous connection in which some of the pulmonary veins (usually the right pulmonary veins) connect anomalously to the inferior caval vein (inferior vena cava) or to the right atrium at the insertion of the inferior vena cava. This heart/lung block is obtained from a patient with Scimitar syndrome. 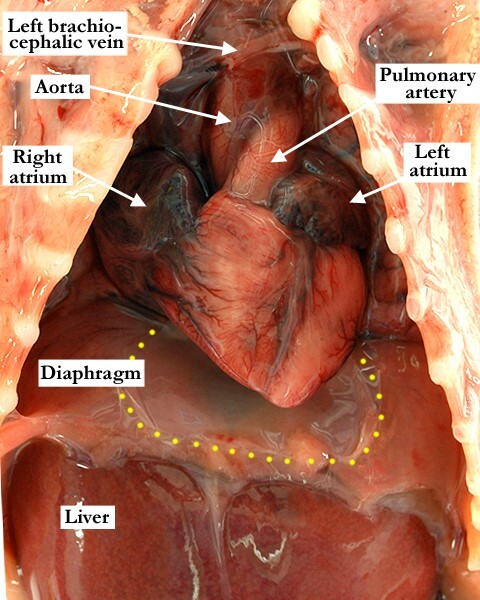 Image # 1 shows the opened right atrium viewed from the front and slightly to the right. A probe has been placed in the solitary pulmonary vein draining the right lung, which opens anomalously into the inferior caval vein immediately above the diaphragm. 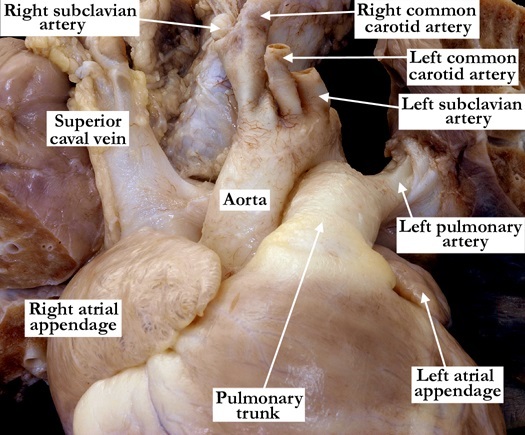 Although not viewed in this image, the left pulmonary veins drained in the usual fashion to the left atrium. IPCCC Definition A congenital cardiovascular malformation in which the heart is central or midline within the thorax. The anterior portion of the sternum and ribs are removed to demonstrate the in situ position of the heart which lies in the midline with its apex pointing down. The yellow dots mark the limits of the diaphragmatic aspect of the pericardium.